I travel for two reasons — the memories I carry with me afterwards and the expansion of my understanding of the world. Trips I took decades ago still loom in my consciousness; sharp, fresh moments of joy and profound satisfaction. I remember visiting the pueblos carved into the side of mesas in Colorado when I was eight. 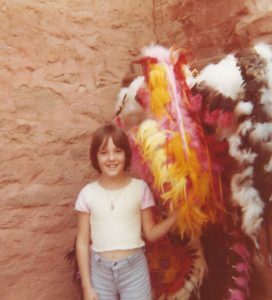 My mother snapped a photo of me next to an elaborate feather headdress. My imagination was alive with wonder for this native culture I was only just learning existed. Summer 1978, visiting the pueblos in Colorado Springs, CO, USA. 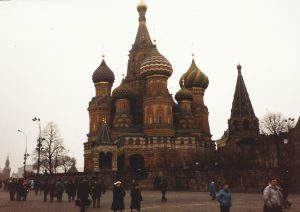 I recall staring up at the colorful beauty of St. Basil’s Cathedral in Red Square in March of 1991, not yet aware that the Soviet Union was mere months from ending as an official nation state. That night, as my fellow students and I traveled to Novgorod on an overnight train, we drank hot, sweet tea served from a samovar in glass cups nestled in filigree. I felt like I was in a spy thriller, or perhaps a noir film. We learned the next morning that tanks had rolled into Moscow. A most magical memory: walking on packed, wet sand after dark on Tybee Island off the coast of the state of Georgia. I watched my footsteps glow bright purple from the phosphorus in the water. Waves crashing against the nearby sea wall sparkled iridescent against the inky sky. The photos of that live only in my head. Watching pelicans dive for fish in the roaring surf of the Gulf of Mexico—that had me hypnotized for the better part of a lazy afternoon on a white sand beach. Riding a bicycle under the cheerful sun into Tulum the next day, I was amused to see a rock star without his usual hideous makeup eating a humble meal a few tables over from me. 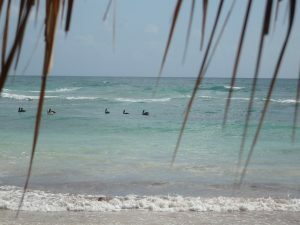 Pelicans in the surf off the coast of the Riviera Maya, near Tulum, Mexico. Photo by author taken in March, 2008. These moments, and so many more, have fed my soul through the years, possibly more than any other life experience, aside from raising my son. Perhaps I’d have more assets to my name if I didn’t spend precious discretionary income on travel, but I regret none of my travel expenses so far. In 2000, my husband (long before he became my husband) was dealt a terrible injury. In a wrestling accident, his cervical spinal cord was damaged. He spent his 30th birthday struggling to walk again. In those dark early days, he vowed he would take a pilgrimage to Santiago de Compostela in Spain, should he regain the use of his body enough to do so. Last year those plans finally began to coalesce. 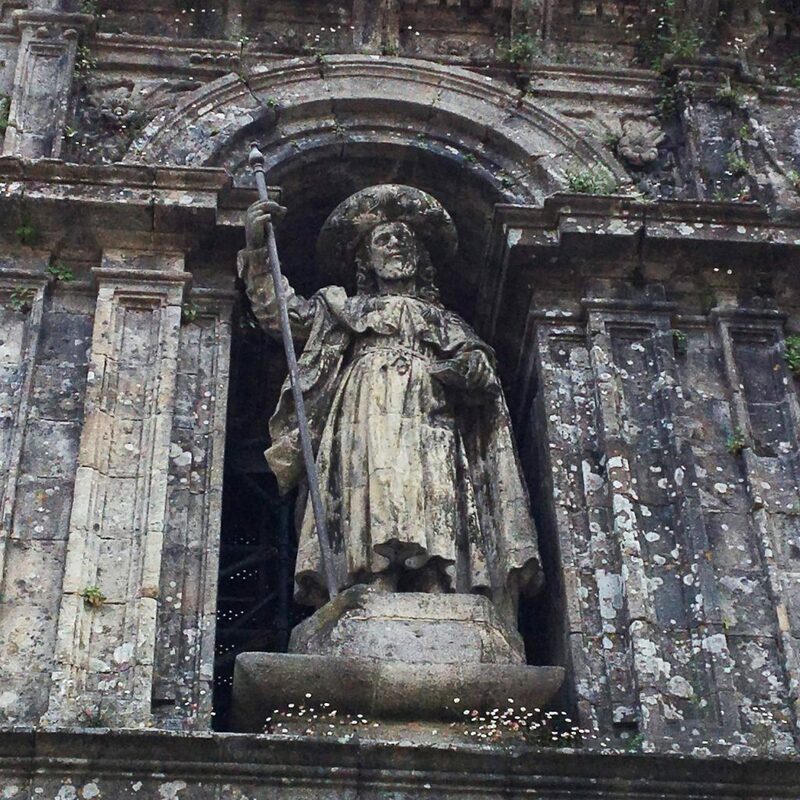 St. James on the cathedral bearing his name in Santiago de Compostela. 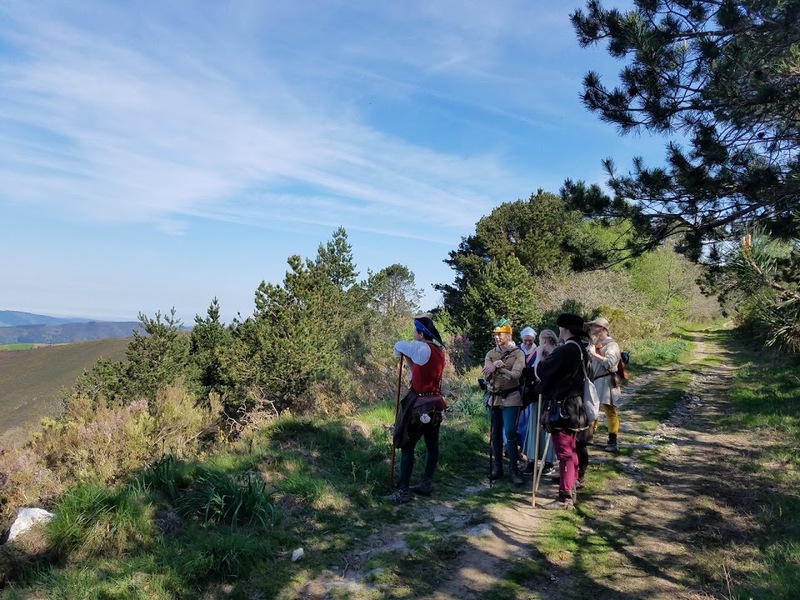 We had a small group of friends from our re-enactment group, La Compagnia della Rosa nel Sole, who also wanted to take this walk, and better yet, were interested in doing so in medieval gear. 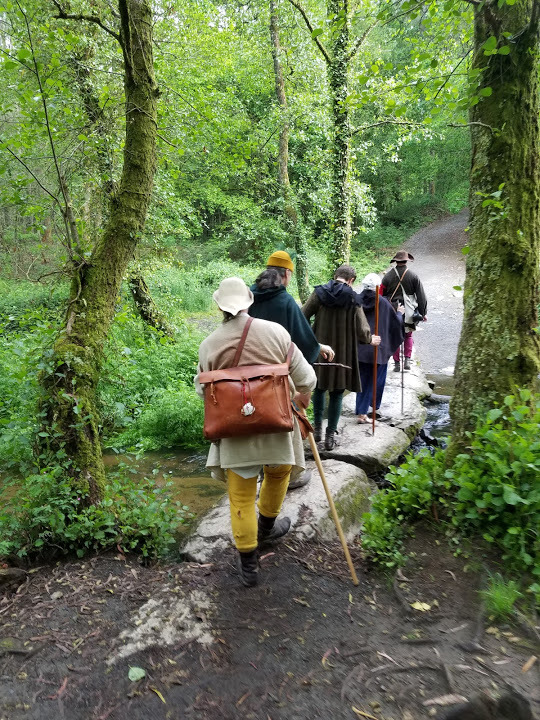 We all wanted to immerse ourselves; to feel the daily experience as it might have been felt by pilgrims in the late 14th century, when pilgrimage was a pervasive part of Europe’s culture. 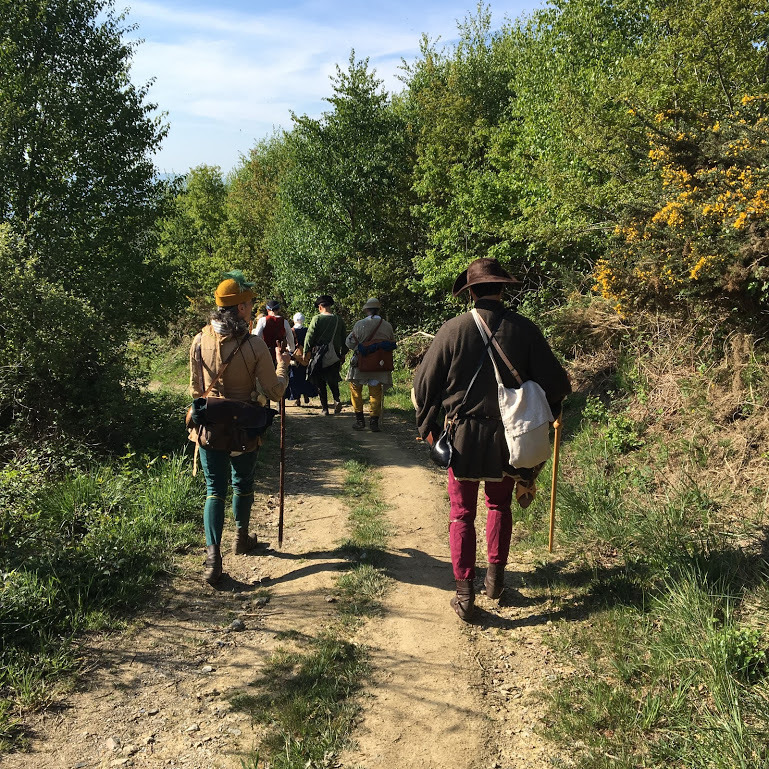 As we also had a growing tradition of attending Il Torneo del Cigno Bianco (The Tournament of the White Swan) every two years in the Verona area of Italy, we decided to pair our Camino walk with that trip during the first weekend of June. 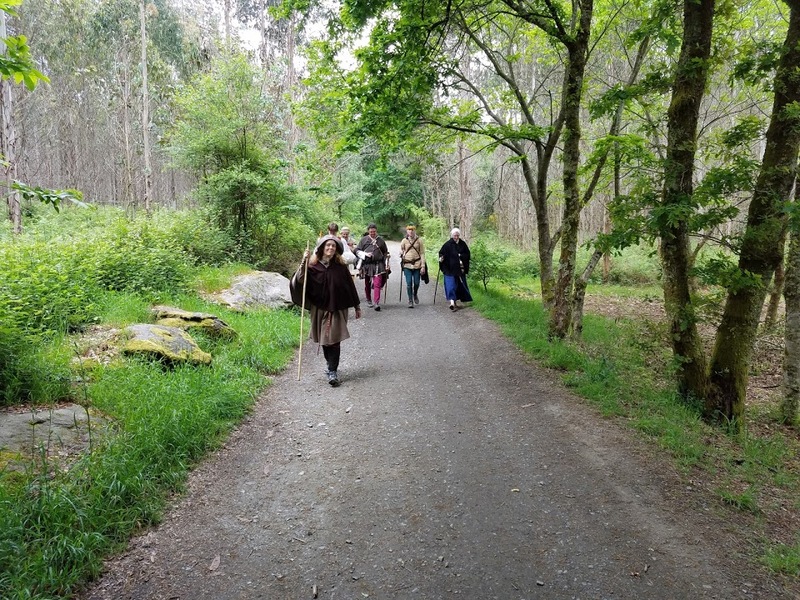 Galician weather in May is mild—ideal for walking over mountainous terrain. 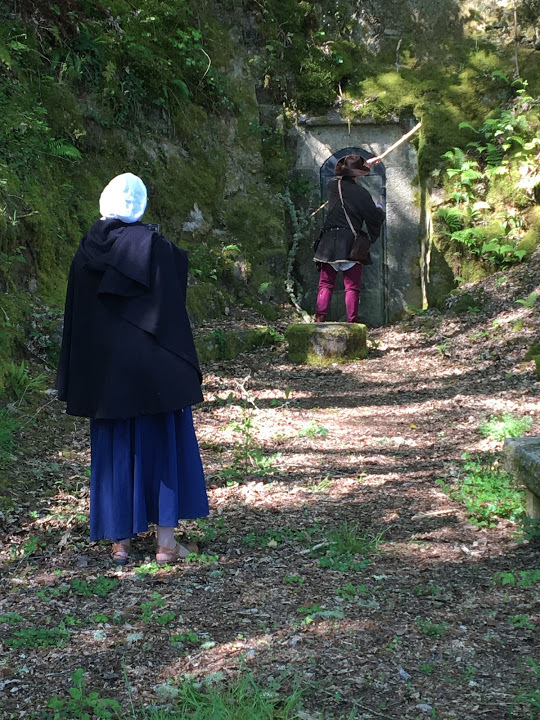 We picked the Primitivo route, which begins in Oviedo and travels southwest through Asturias into Galicia to Santiago de Compostela, where the tomb of St. James resides. We had some warning that it was the most challenging and rustic route, but somehow the reality of this was unattainable until we actually walked it. More on that later! My Google map, on which I dropped pins for our accommodations. 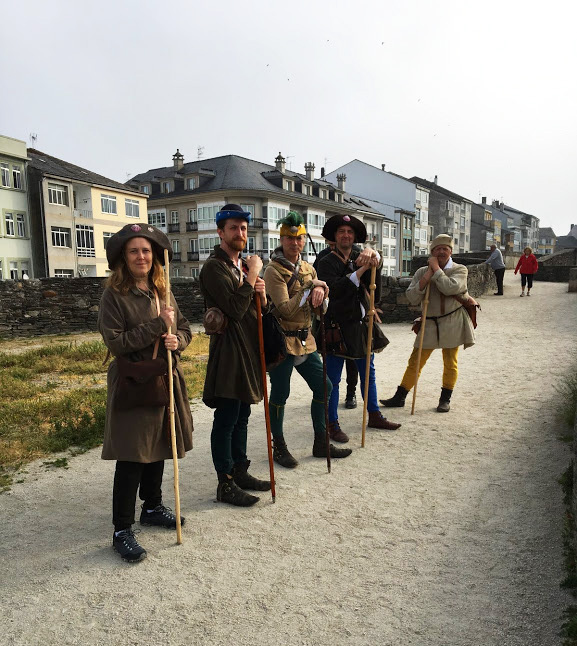 Due to my family schedule and the obligations of my husband’s businesses, we could only join our group of walkers about halfway through the journey, on the outskirts of a town called A Fonsagrada. 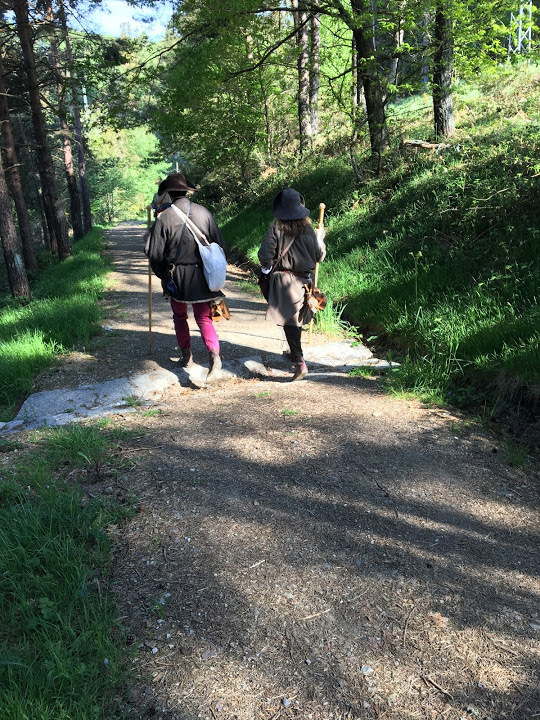 This was 150 km (about 93 miles) from Santiago, which was more than enough to qualify for receipt of a Compostela, an official document issued by the Roman Catholic church acknowledging one’s completion of a walking pilgrimage of over 100 km to the tomb of St. James. We would walk for six days to reach our destination. Our group united in A Fonsagrada, Galicia. From left to right: Greg, Marc, Matt, Sarah (our chase car driver! ), Elisabeth, Christian, and Steve. 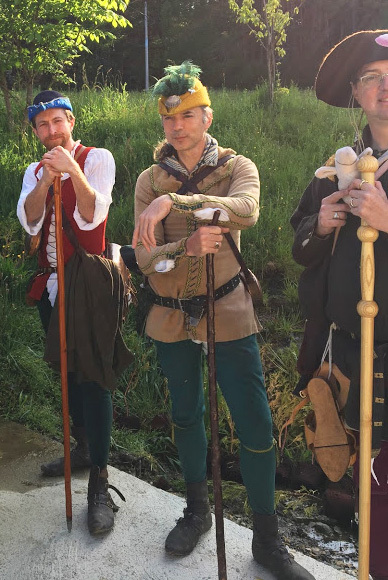 As we needed specialty gear for both the pilgrimage and the tournament in Italy, we hatched a complicated plan that involved flying first to Italy to drop off half of our gear for the tournament at the inn we called home when attending this event. While briefly there, we met with a local historical shoemaker, Graziano Dal Barco, who kindly hand-delivered a bunch of shoes and beautiful pattens to us. We then flew on to Spain, where our friend Sarah and her daughter Beatrice met us and another pilgrim, Steve, and drove us to join the pilgrims already in progress in A Fonsagrada. 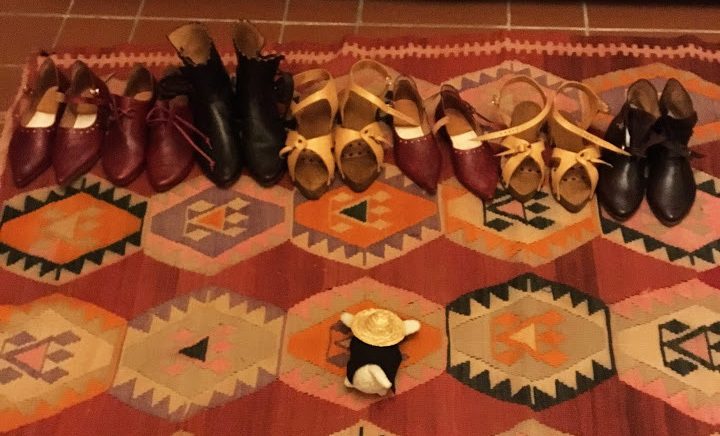 Felipe the Pilgrim Sheep reviews our shoes brought to us in Verona by Graziano Dal Barco. The dark brown boots are the ones that got us in trouble later on. Beautifully made, but just too small for the task at hand. We had a hearty dinner which included Galician-style octopus, slept well, and were off to begin our epic hike early the next morning. The Primitivo trail hid in the forest across a field behind the motor lodge where we stayed. Our group now numbered seven: myself, Greg, Christian, Matt, Marc, Elisabeth, and Steve. Sarah and Beatrice, Christian’s wife and daughter respectively, would stay with the car, transporting luggage from site to site each evening, though Beatrice chose to walk with us that first day. She made it look easy. Ah, fit youth! Here I am, completely unprepared for the adventure before me, but believing I’m ready, nonetheless. Steve, Beatrice (the 14-year-old ballerina who made it look easy), and Elisabeth are standing by. Matt, Christian, and Greg, looking ready for anything. Good thing, too, because this was to be the Day That Never Ended. Greg and I had diligently trained for this hike by walking long distances in local forest preserves in northern Illinois. What we did not adequately train for was the mountainous topography. We had no idea how many mountains there would be. So. Many. Mountains. Not hills. MOUNTAINS. That first day can only be described as a haze of wonder and panic—Was this what asthma feels like? Was I really seeing so many stunning mountaintop vistas? Could I walk on stumps if my feet fell off? 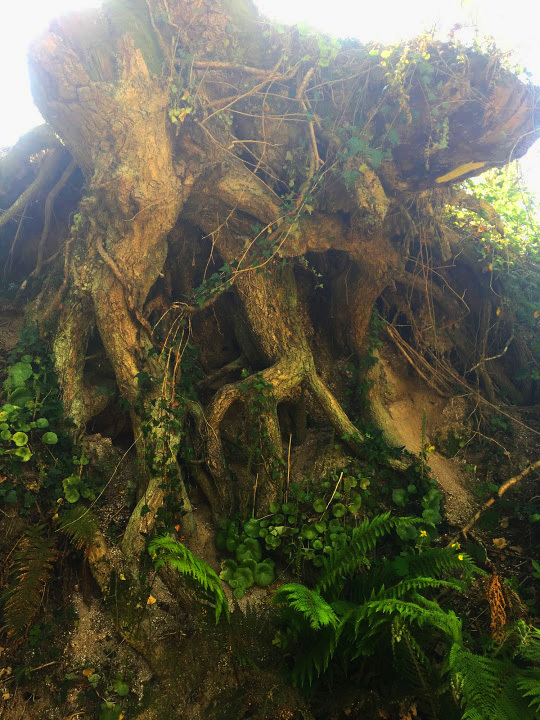 Was I in Rivendell? Was I having a cardiac situation? A typical steep ascent. Vexingly aerobic while simultaneously picturesque. We passed through many tiny rustic towns where very little had changed in 1,000 years. 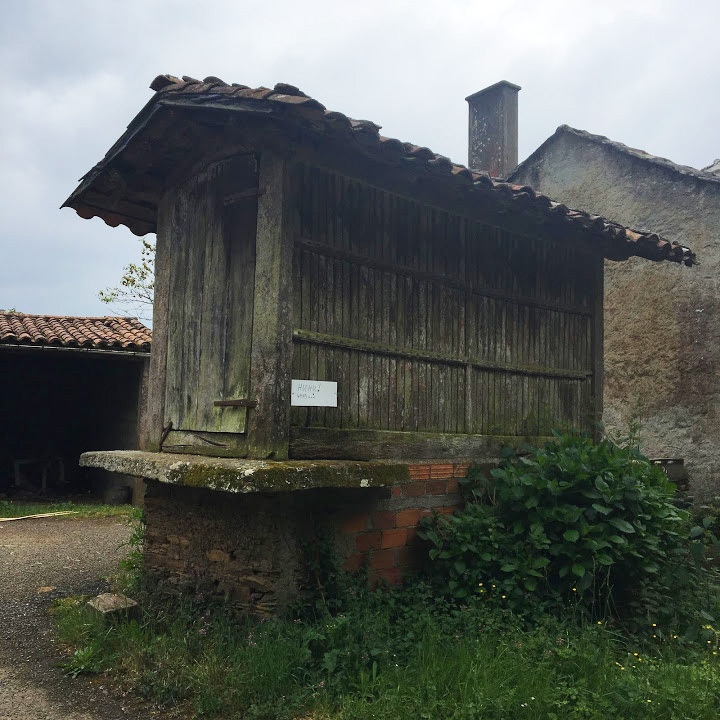 Sure, there were gas-powered tractors parked about, and electricity, but some of those stone houses were still witness to homemade chorizo and cheese and bread that was baked with a hard crust so it could last a month until the next bread-making session. People live very simply and are, for the most part, farmers. They’re particularly partial to growing kale and Swiss chard. A typical raised grainery in Galicia. They’re raised to keep vermin out. Most are unused now, and exist in varying degrees of rustic decay. As the day progressed, my feet became my focal point of discomfort due to my beautiful medieval shoes being a size too small. As per the shoemaker’s instructions, I soaked them in every stream I came across, in hopes they would stretch as I walked along. Alas, after 26 km, they still had not stretched. I simply needed a larger size. 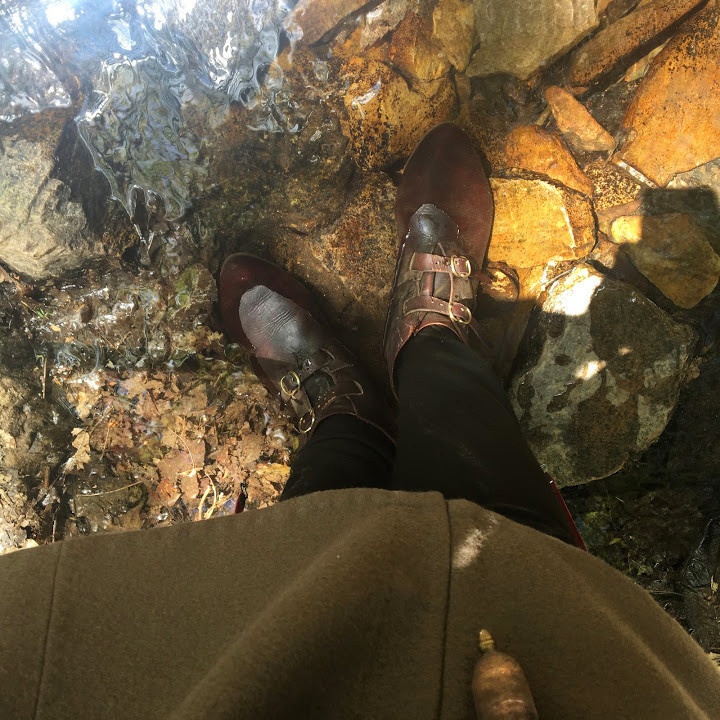 That night I made the decision to switch from period footwear to my modern hiking shoes. My muscles could survive the challenge, but without fit feet, I would be doomed. Soaking my too-tight shoes in one of a number of streams I encountered that first day. The shoes were admirably water-tight, but did not stretch one bit. Each mountain top we conquered then rewarded us with stunning views for miles. 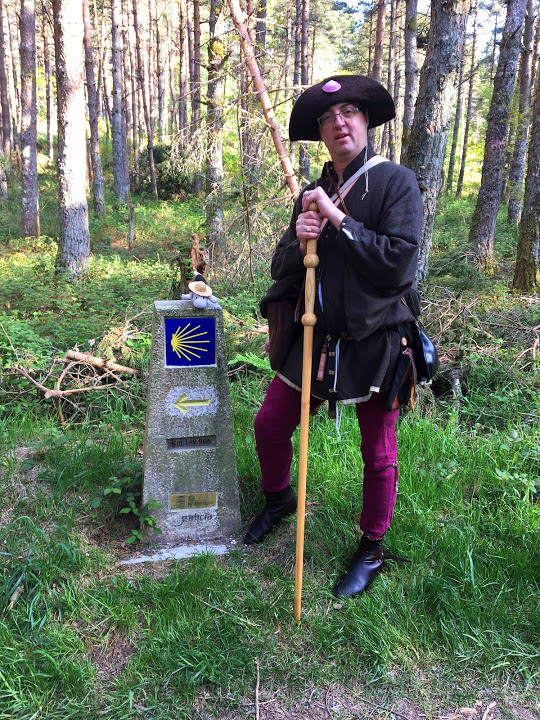 This was the first camino marker we encountered. We had about 150 km to go before reaching Santiago. Greg and Felipe posed to commemorate the moment. It didn’t take long before we were rolling up our sleeves. A rare photo of me walking ahead of someone! I usually brought up the rear, which was fine with me. I was shortest, and the only uncaffeinated walker in the group. This is more like it. I was usually last due to aforementioned shortness and lack of caffeine-powered energy, but I also liked to take pictures, and stopping even for a few seconds to do that could put many meters between me and the others. Climbing a hill in the sun, my favorite! You can tell by the look on my face! Photo by Stephen Callahan. Here we are, admiring another stunning vista on a mountain top. Just as our elevation changed constantly, we frequently passed in and out of deep woods. We all preferred the woods: lovely, dark, and deep, to borrow a famous poet’s words. The grand scale of what we traversed can just begin to be seen in this photo by Stephen Callahan. 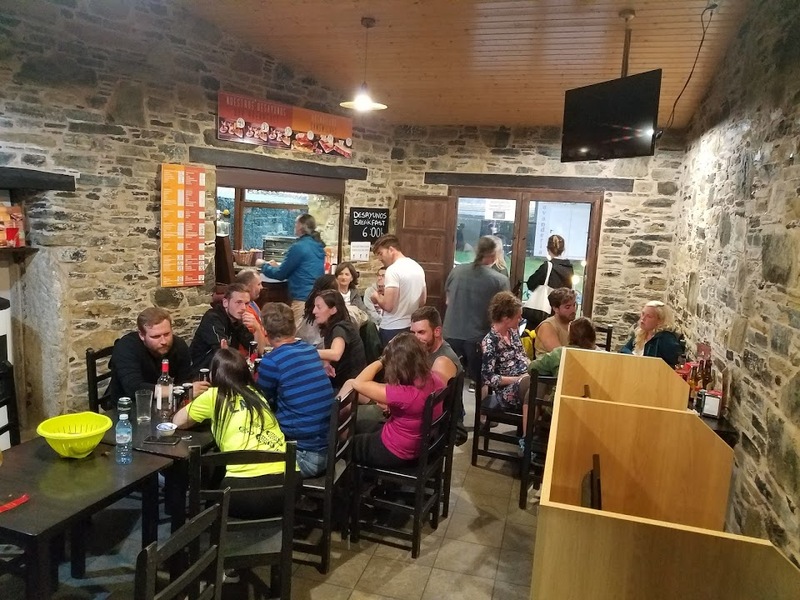 When we finally arrived in O Cadavo after a grim final five-or-so km, some of us stayed at a pilgrim’s albergue, and some of us stayed at a local hotel. We all decamped to the Hotel Moneda for late afternoon refreshments (wine and beer) while we waited for the restaurant to open at 8 pm. The whole “nothing is open between 2 pm and 5 pm but the bar and you can’t eat dinner until 8 pm” thing was incomprehensible to me. Beers and laughter with Matt, Marc, Christian, and Felipe at the end of the first day. We hung out at the Hotel Moneda in O Cadavo Baleira waiting with so much yearning for the dinner hour to arrive. 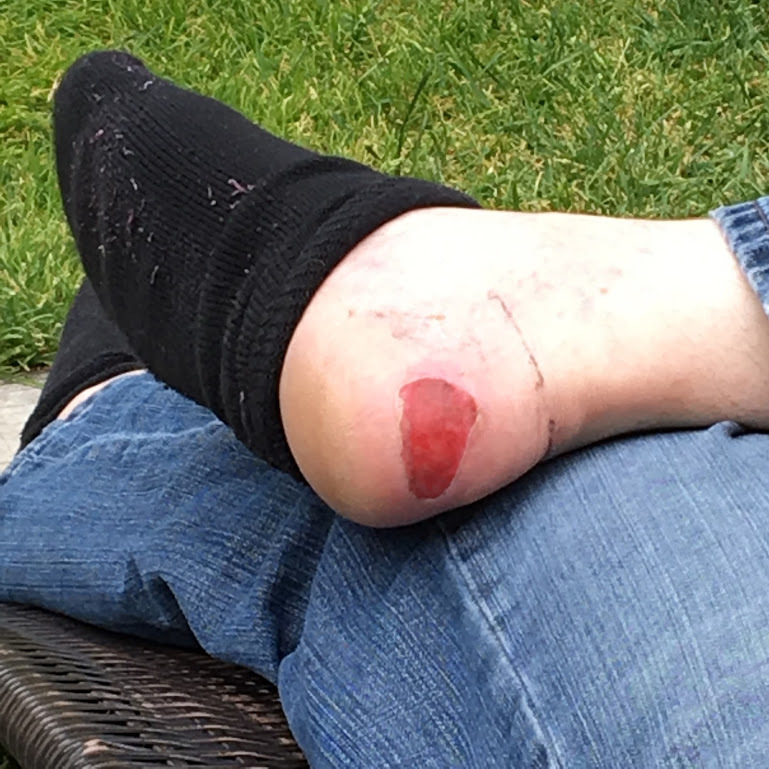 When Greg took off his shoes and examined his feet, we found that he’d cooked up some spectacularly large and raw blisters on his heels. His beautiful boots from Graziano were too tight in the heel. Fortunately I had a well-researched, and well-stocked foot-oriented first aid kit with me. In the morning I covered his heels in Compeed and then put some benzoin tincture around the edges of pieces of kinesiotape and glued the tape down over the Compeed. 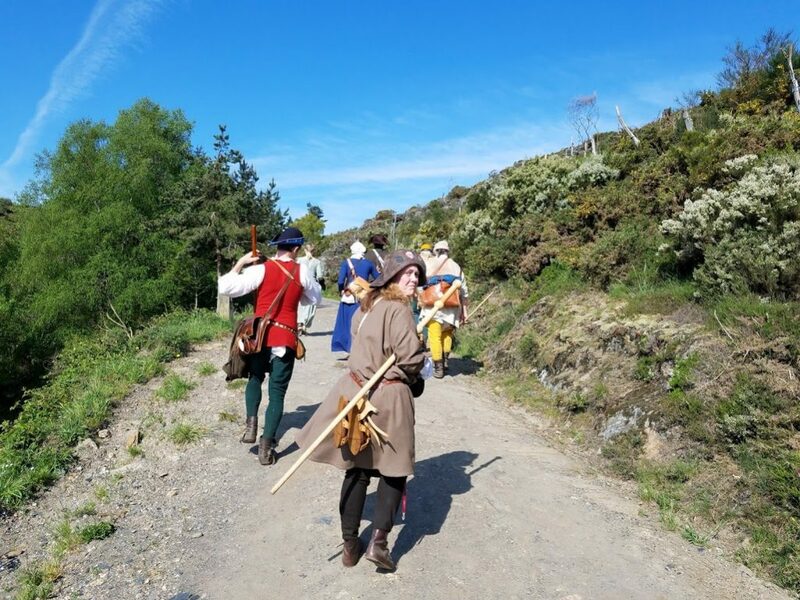 There was no way he would get through a long day (or five) of walking with anything less than this arrangement, plus ibuprofen and a pair of back-up boots from Bohemond. Fortunately, it worked. He was able to walk on. One of Greg’s two mangled heels. This photo was taken after the 4th day of walking. Holding steady, no sign of infection. We poured iodine over them shortly after this photo was taken. 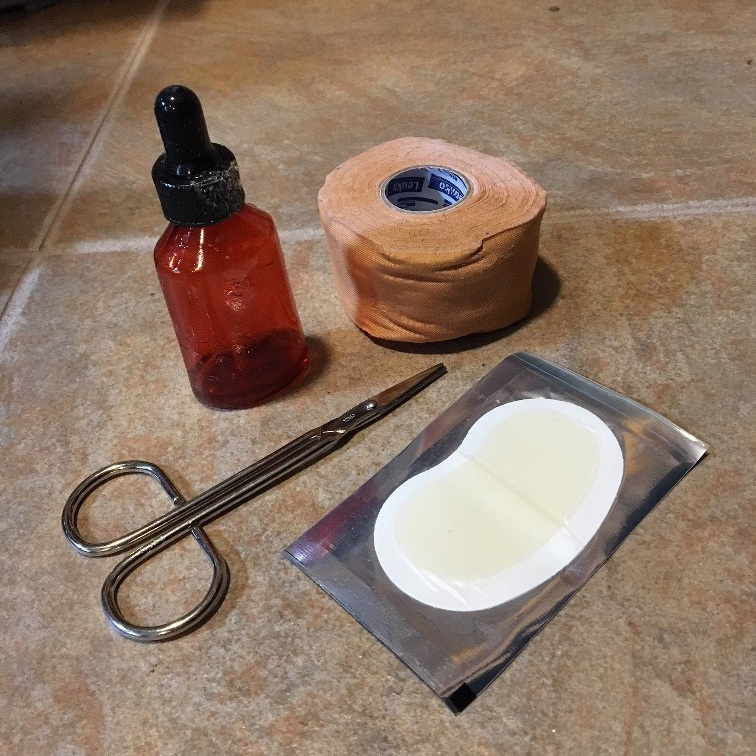 These four items were mandatory: tincture of benzoin, kinesiotape, scissors, and Compeed (or comparable brand of blister “second skin”). The next day was harder on my muscles than Day One, which was to be expected. My feet were getting relief, but the rest of me howled in indignation. So much for all that walk training! 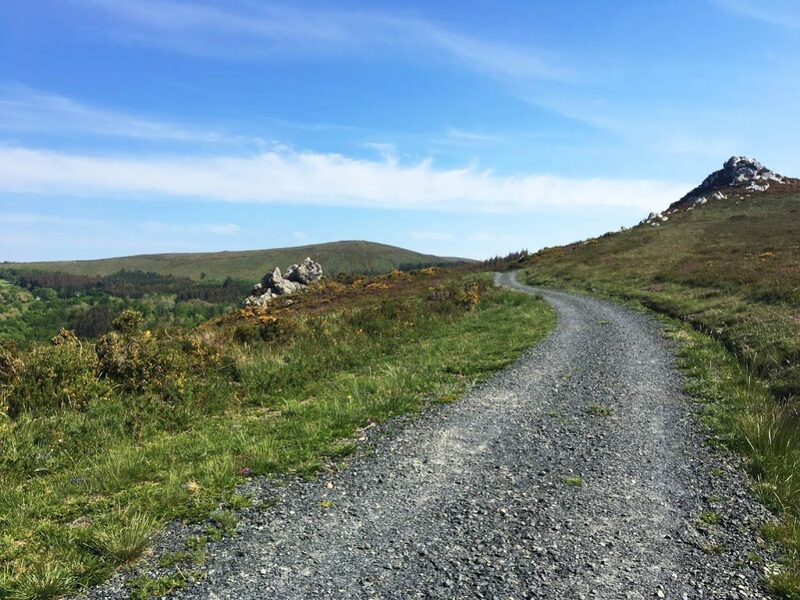 I suppose without it I’d have been in truly terrible pain, but still… I cannot stress enough how important it is to get in good shape before going on Camino! The views continued to be stunning. I was thrilled that a good 90% or more of our route went through forests and along mountain ridges, rather than on roads. 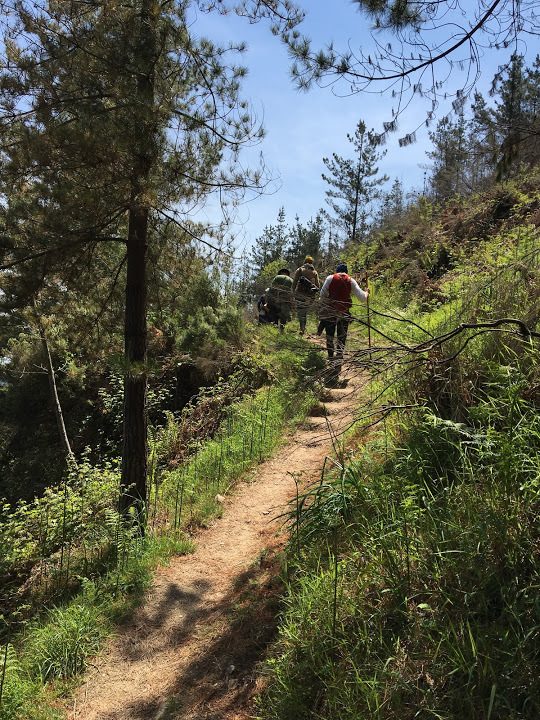 While the Primitivo is the most physically challenging walk, it is probably also the most beautiful and natural one. We frequently walked through sunken paths surrounded by exceedingly old trees. Exposed root balls are a Thing on the Primitivo. You might think that we’d get tired of all the stunning vistas, but I never did. We joked about their frequency, but each one was a gift to my soul. On this day we took a “complimentario” route, which are optional side trips along the Camino to see church-related sites. 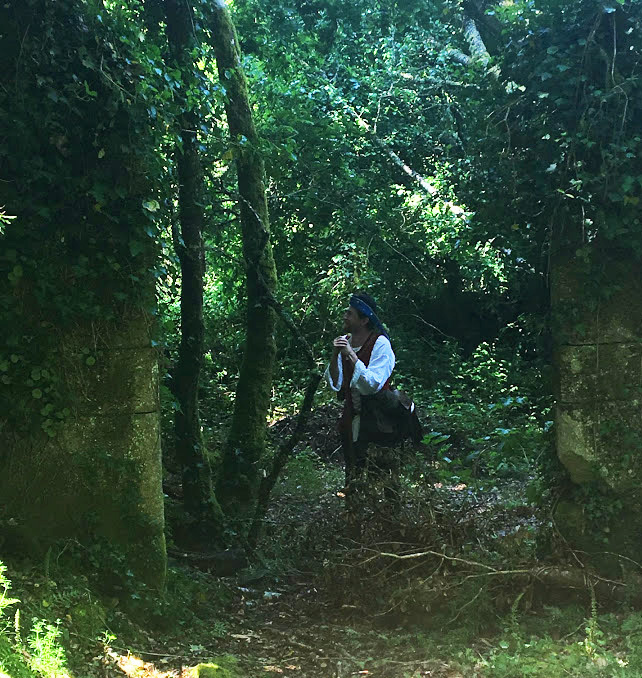 We explored what remained of a 12th-century village and church. The lush quiet of the forest and the melancholic atmosphere of the old stone ruins had my imagination percolating. 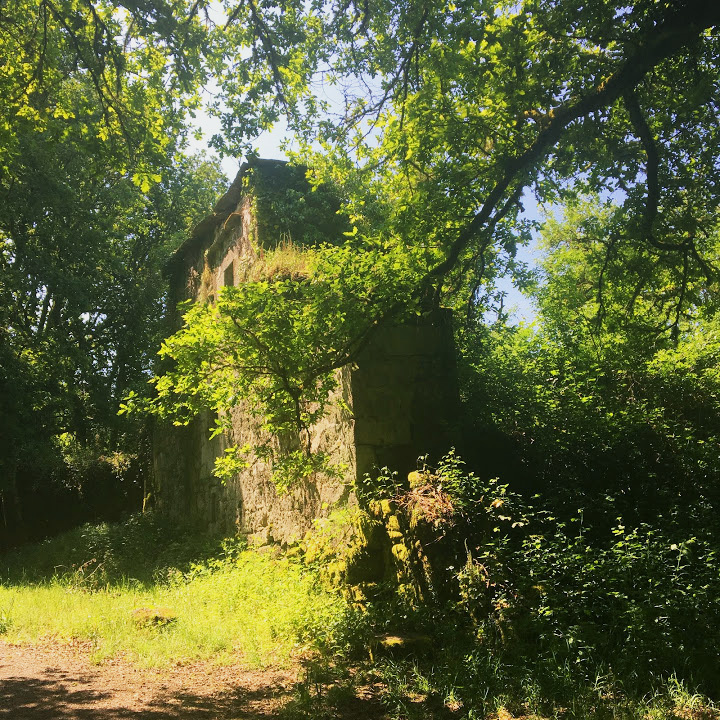 A crumbling stone building from an abandoned medieval village on the complimentario route. Oh, the gothic stories that could be spun from this inspiration! A long forgotten 12th century church in the crumbling remains of a medieval village. “Speak friend and enter.” We found this door in the side of a hill. No explanation. Greg said “friend”, but alas, nothing happened. At the end of Day Two, we stayed at an apartment in Lugo, which is famous for its Roman walls. The next morning, fortified by a hearty breakfast cooked by Matt, we walked along the top of the walls, and went to the cathedral to get a stamp (sello) in our credencials, which are a passport for pilgrims to collect evidence of all the places they’ve walked through. The docent apparently thought we were from a Catholic order, given our dress, and enlisted a priest to say a blessing for us. We told her where we were all from (Illinois and Pennsylvania in the US; Toronto/Ontario in Canada) and she asked if we were allowed to all be together, the men and the women. Thinking she was asking us about our home parishes, Christian and Greg said, “Yes,” and she nodded with a pensive and puzzled expression on her face. We proceeded on our walk as mass was starting. The done thing would have been to stay, but the day was marching on, and so also must we. Standing on the Roman walls that encircle the old city in Lugo. As you can see, my body was modern from the ankles down. My hosen had started to droop, but I was too tired every night to drag out my sewing kit and take them in. Living in baggy hosen seemed like a small concession for getting rest. Day Three was probably the most taxing for me, as Christian, Marc, Elisabeth, and Matt had warned it would be. 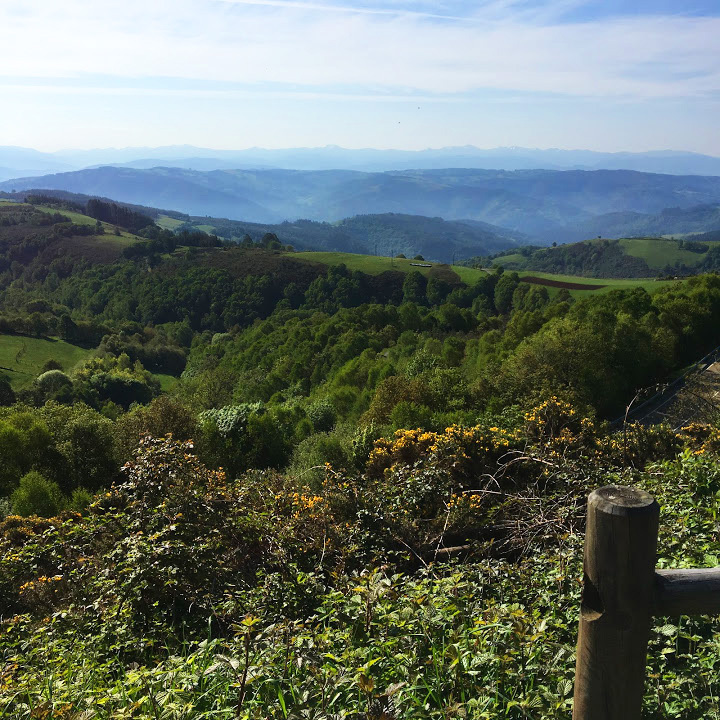 We had a steep descent followed by a steep ascent out of Lugo, and the sun was brutal that morning and afternoon. There was a fair bit of hiking along unattractive, paved roads. We dodged fast-moving cars while the sun beamed down unrelentingly. 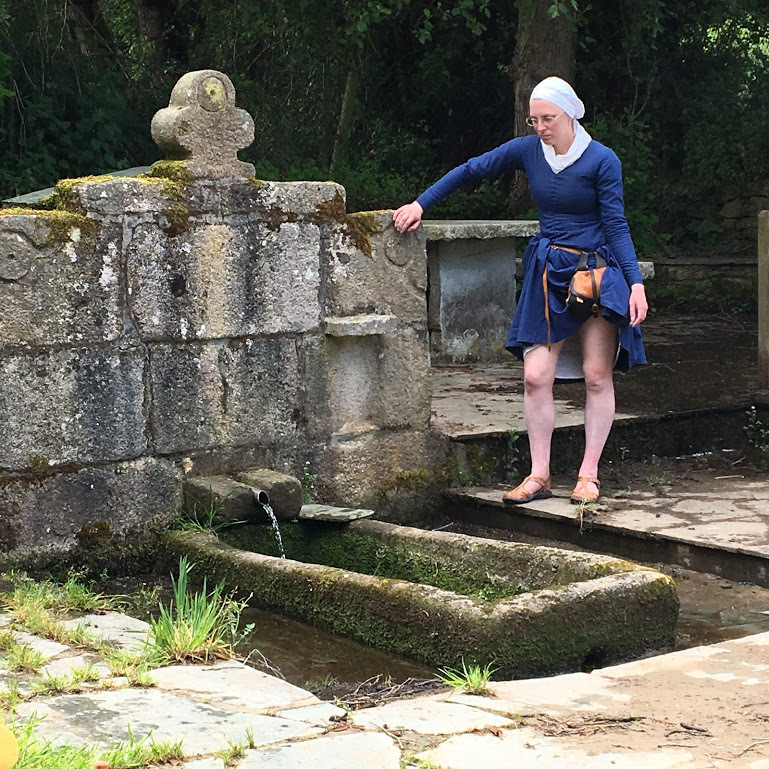 It turned out to be taxing for Elisabeth and Christian too, who both got acquainted with stinging nettles during a stop at a pilgrims’ spring. Elisabeth airs her legs out after stinging nettles had their way with them. The leaves on this oak tree were a revelation. 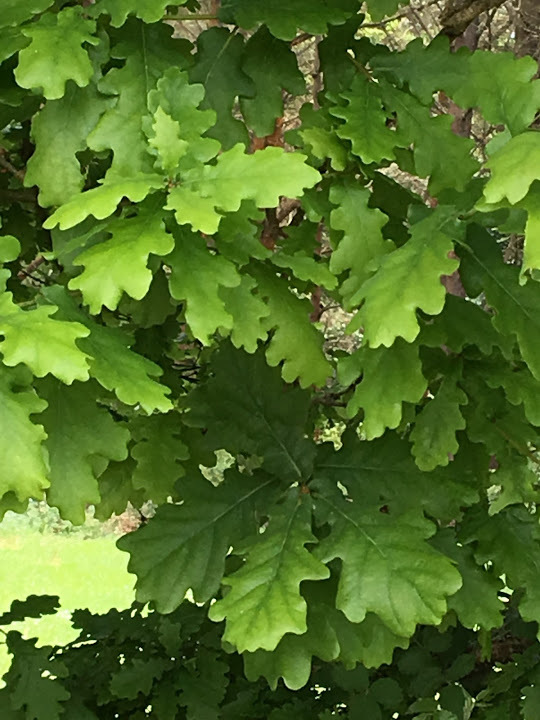 The oak leaves I’m used to seeing at home in the US are completely differently shaped. 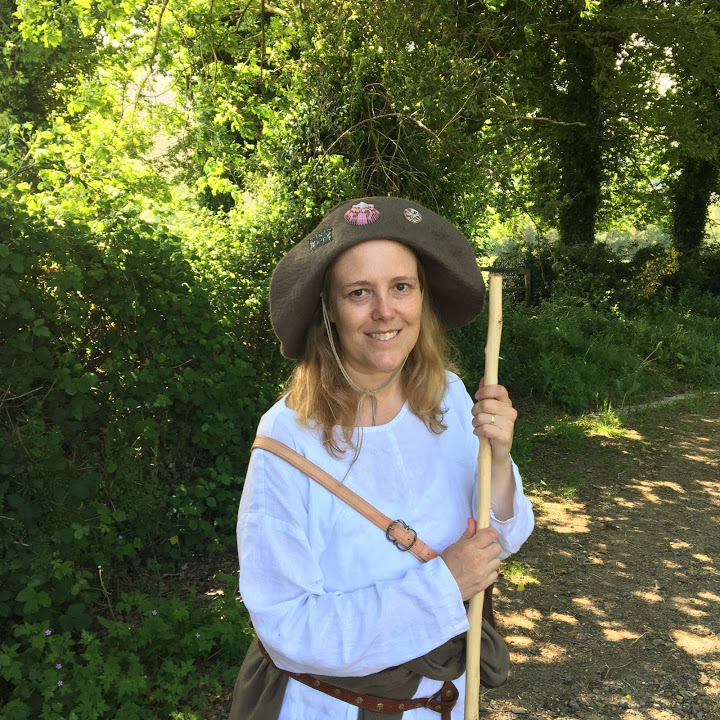 When viewing “oak leaf dags” on 14th-century clothing, however, they now make much more sense to me when compared to an actual European oak! Much of what we walked through was a tunnel of greenery. Fortunately, our stopping point that evening was a beautiful inn called Casa Camiño, which is run by a lovely English couple, Sue and Kim. Kim is a master timber framer who painstakingly rebuilt a ruined stone building into the luxurious and impeccable oasis that it is today. 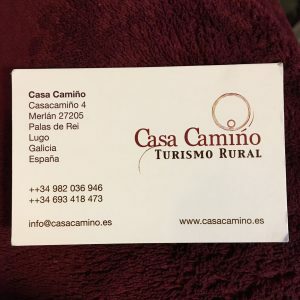 I highly recommend their inn to anyone who either walks the Primitivo or wants to visit Galicia. 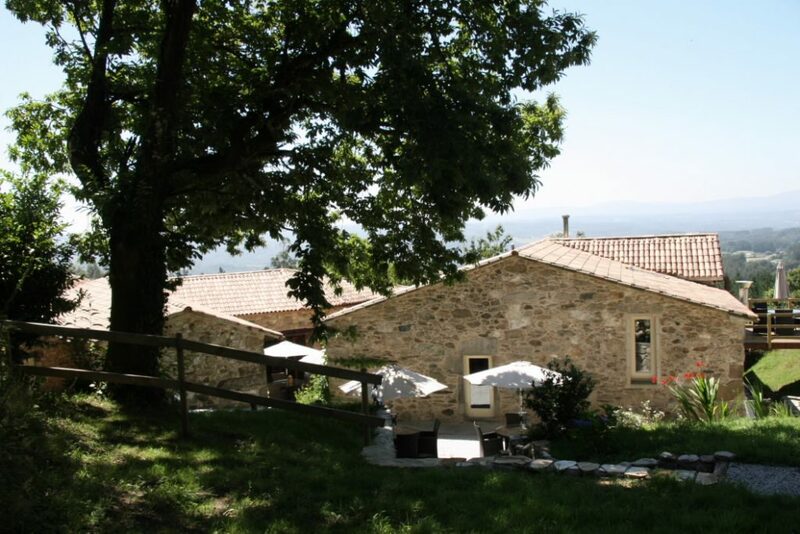 Casa Camiño, is a wonderful oasis of luxury, good food, and good company on the Primitivo. It’s located between San Ramao da Retorta and Melide. A view of the inn. Kim and Sue make a spectacular effort to pamper you here. 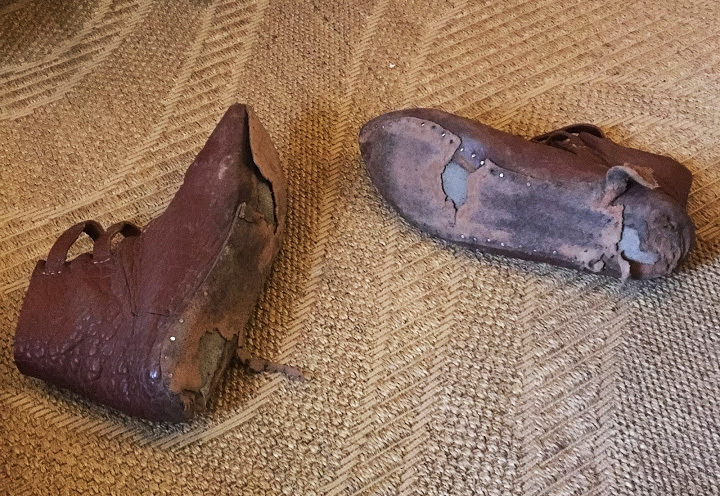 By the end of Day Three, Greg’s substitute shoes from Bohemond had worn out completely. The soles were not made of sturdy enough leather to withstand all-day hiking, day after day, on rough surfaces. Steve kindly lent Greg a pair of his extra shoes so he could continue on. If Day Four had a theme, it was “take it easy” and “interesting interactions with others”. While the rest of our group headed out around 9:30 AM, Greg and I lingered until 11 AM and set out at our own leisurely pace. 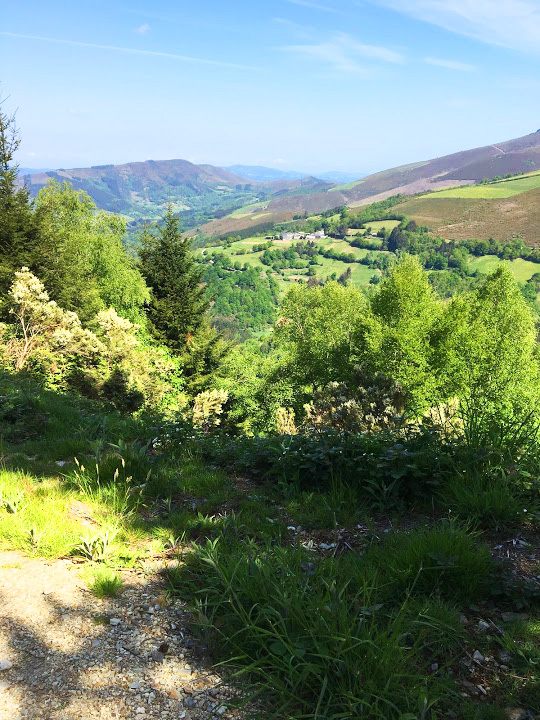 The walk started out with the usual brutal ascent, but we went slowly and stopped frequently to take in the views and the local flora (which never failed to be super-gorgeous). Walking on top of a mountain. The wide-open sky and rocky outcroppings reminded Greg of Weathertop, from the Lord of the Rings trilogy. The wildflowers all along the Primitivo route were amazing. 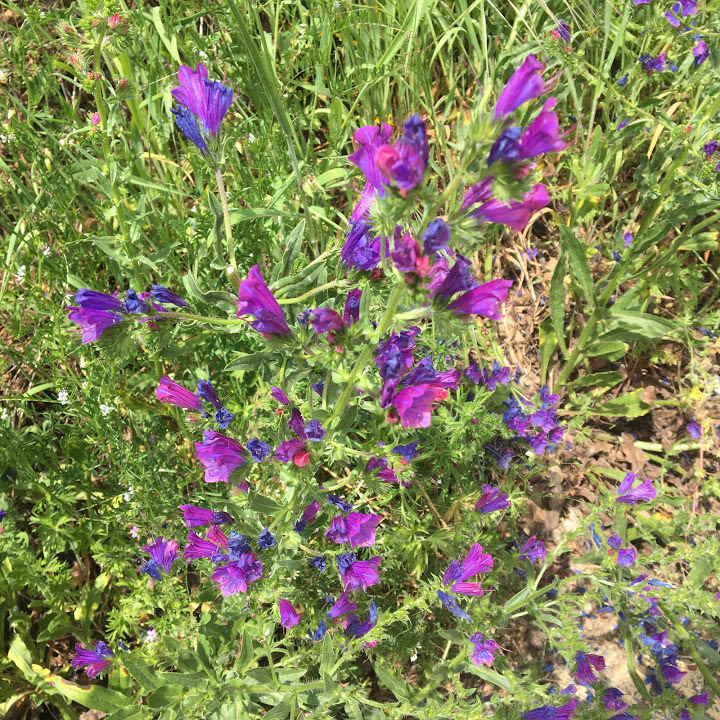 These purple-blue flowers in particular captured my fancy. 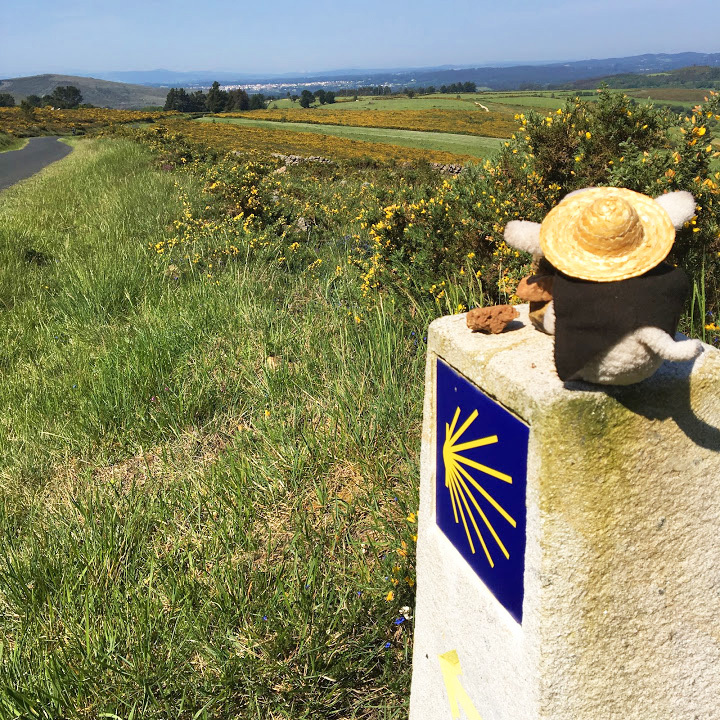 Felipe surveys the view on top of a Camino marker. In the distance is Melide, our next destination. Yours truly, weary, but still going. It was hot that day, so I walked in just my white linen shirt, braies, and hosen. When we arrived in Melide, Steve kindly came to meet us and usher us into the albergue where the others were gathered. For Greg and I, this was our first and only stay in an albergue. I was a little anxious because I’m a light sleeper. However, if anyone snored, I never heard it. I had earplugs and a tired body full of all-day fresh air, which is a great prescription for a good night’s sleep. 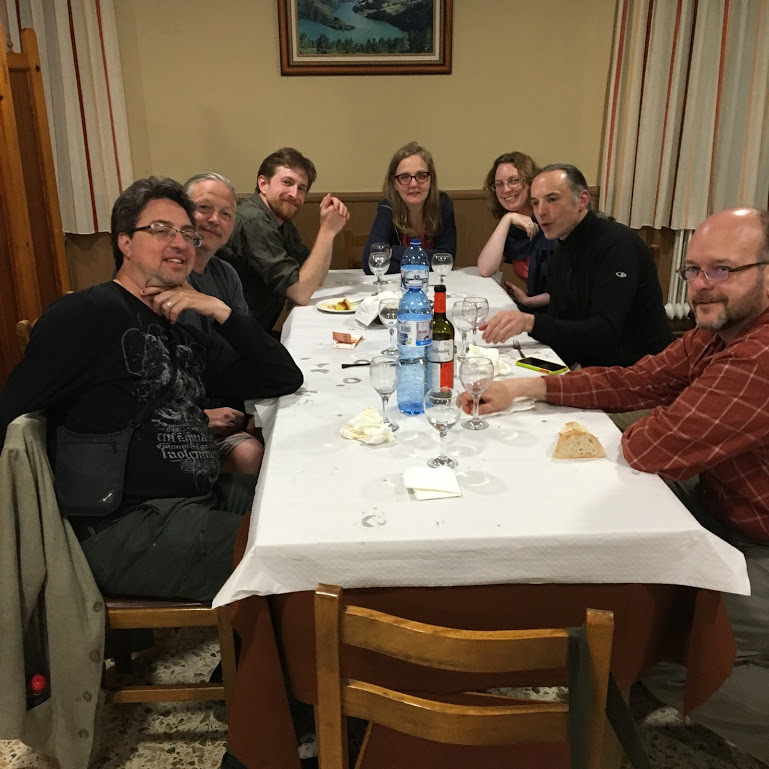 The conviviality of los peregrinos at Albergue San Anton in Melide. Photo by Stephen Callahan. 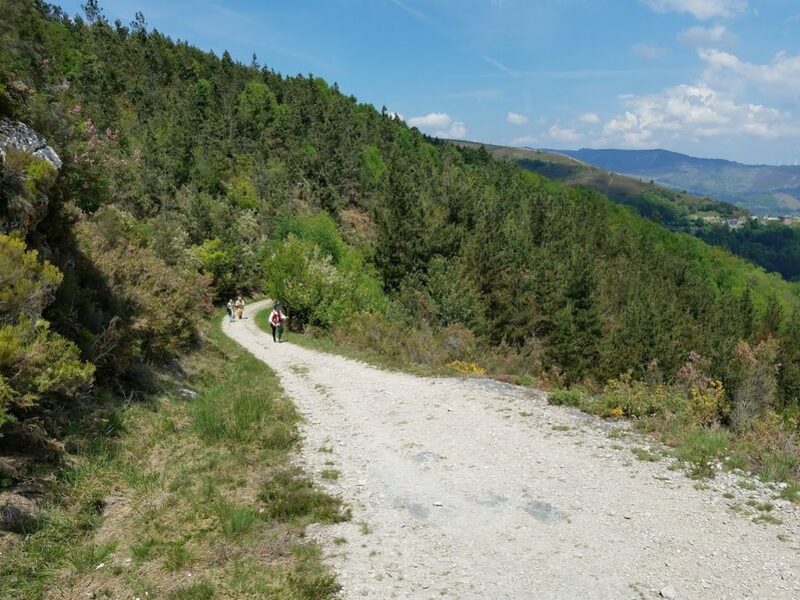 Melide is where the Frances route — the most popular and populous Camino route — joins with the Primitivo route. From here until Santiago, we’d be on the road with lots of other pilgrims. Our albergue was stuffed to the brim with friendly Brazilians who cooked a delicious-smelling dinner and laughed into the evening. A young and handsome acolyte stamped our passports in a rural church. 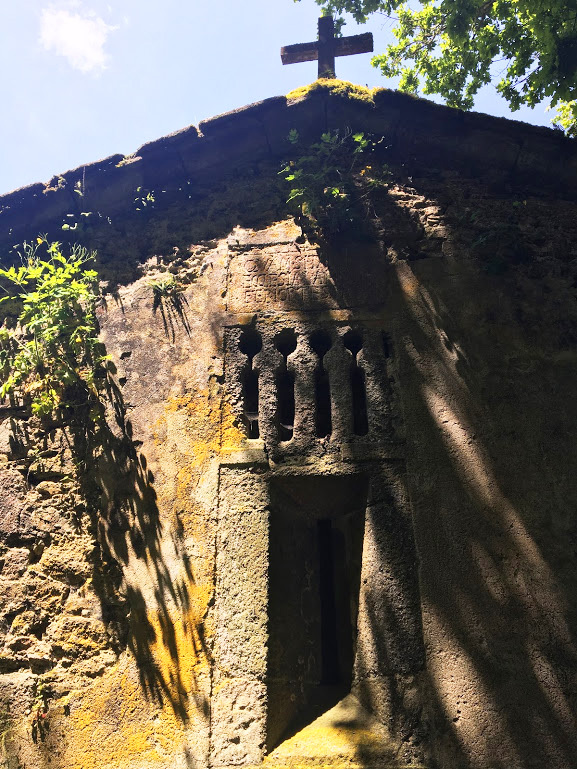 It was unusual to come across an open church in the remote hamlets of Galicia. Day Five loomed overcast and humid. It had just rained before we set out, and we all expected more rain to come. Maybe we’d get to test our wool against the wet. The temperature had lowered, which was a plus, and so I finally had a chance to wear my short silk-lined wool mantle. I was perfectly comfortable wearing it over my wool gown and linen shirt. 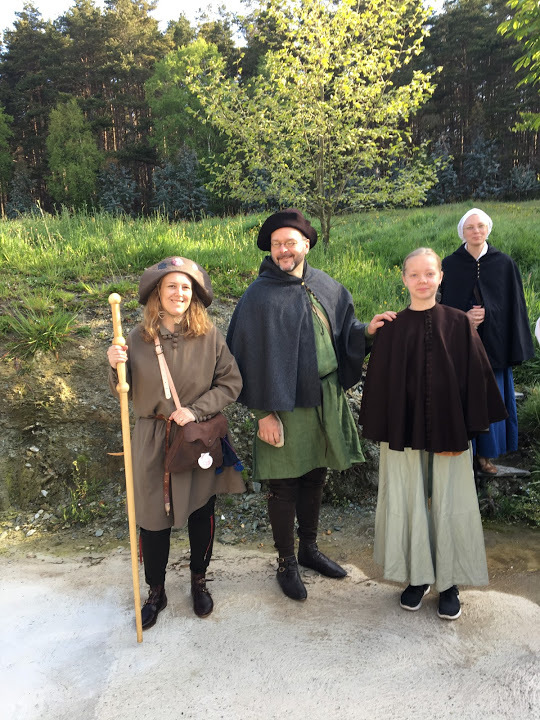 As Christian states in his blog post on our experience, the medieval clothing system is remarkably comfortable in all sorts of weather, and it certainly served us well from temperatures in the low 50s through low 80s (F). Hey, look! I’m in front! 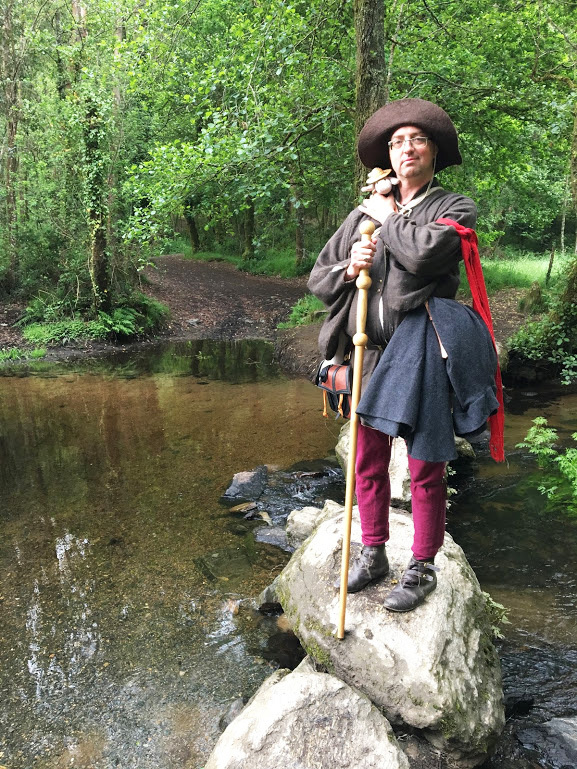 The short cloak was a versatile and great little addition to my traveling wardrobe. Photo by Stephen Callahan. Amazingly enough, it never rained on us. We could see rain in the mountains on either side of us, and people behind us reported getting soaked, but we mysteriously remained dry. I can’t say I’m sorry about that. Now that we were on the road with crowds of other pilgrims, the requests for photos became constant. 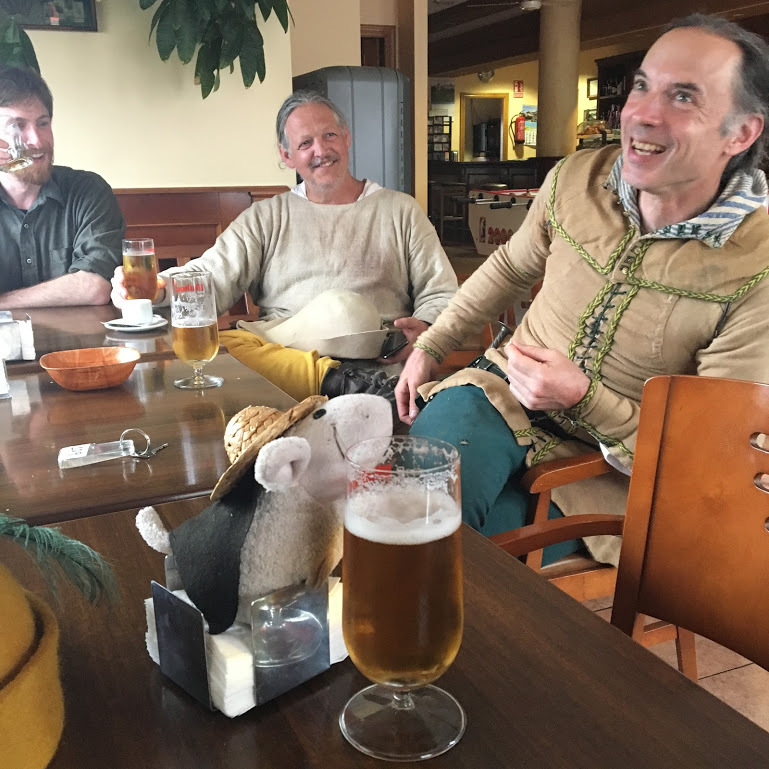 We joked about charging 5 Euros a shot, but after a while, the joke began to seem like a serious discussion. Even though the requests grew tiresome, we still made some lovely connections. A woman from southern California named Marion asked if she could treat us all to a glass of wine at a local bar-café. We happily took her up on that. 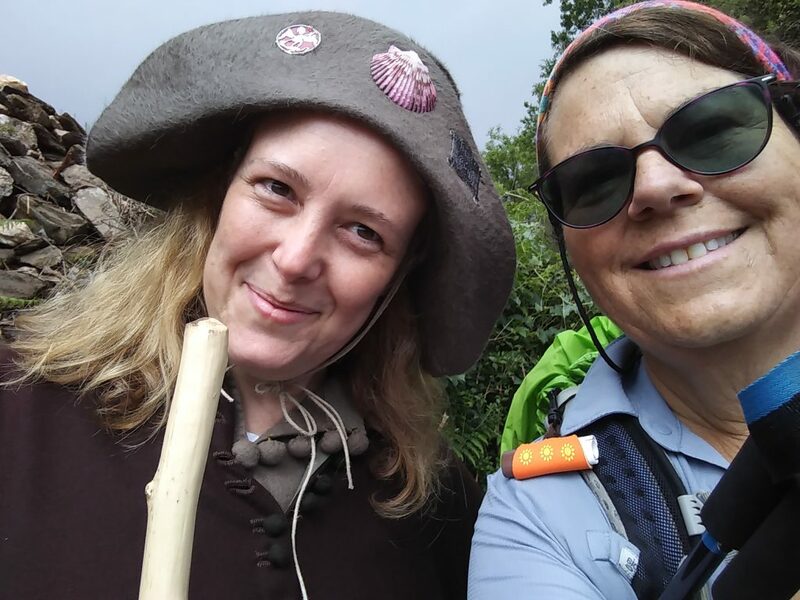 I struck up a conversation with another traveler, Karen, who runs a hiking blog called Hikearumba.com. We corresponded after we got home and she sent me a few photos she’d taken. Karen of hikearumba.com and I pose for her selfie. We talked about Greg and his vow to do the Camino after he recovered from his accident. We crossed many streams in our travels, and they often had rock bridges. Photo by Stephen Callahan. 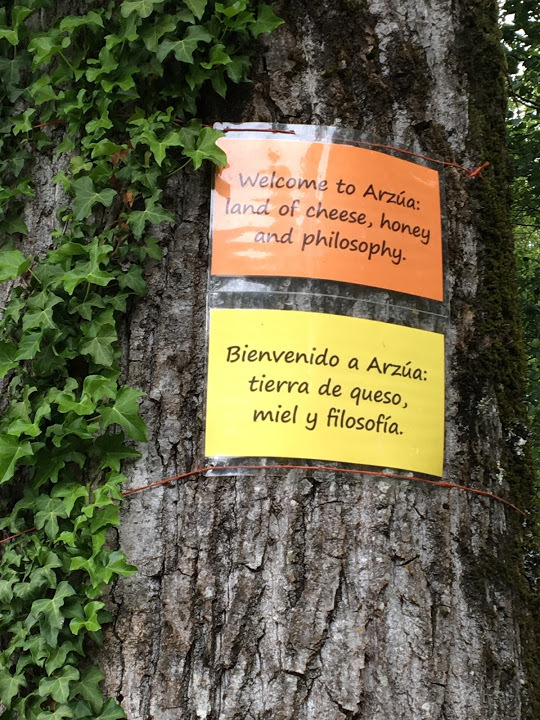 Cheese, honey, and philosophy. I can think of far worse things. That night we stayed in a pension run by an older couple in A Brea. Greg’s and my en suite bathroom had a hot tub, and the first thing I did was take a long soak. Pure heaven. My body was getting the hang of this punishing walking pace, but I still needed help relaxing my muscles at the end of each day. The lady of the house cooked us a wonderful meal, which had a bit more variety to it than the usual Galician restaurant fare we’d grown used to along our way. Most meals were only seasoned with paprika and salt, full stop. I’m pretty sure our hostess used coriander and possibly even turmeric on the tender and delicious ribs she served us. We were grateful for the home-cooked attention. 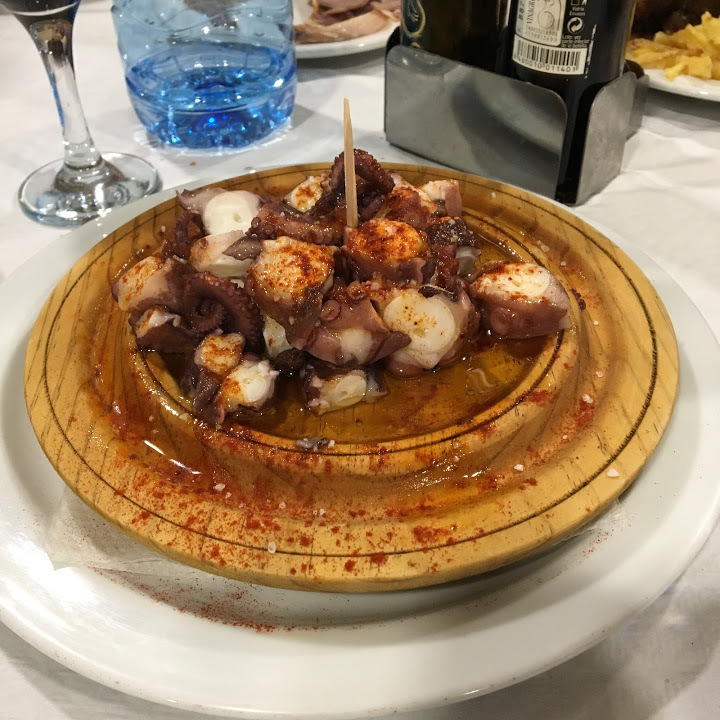 Speaking of food, here’s some Galician octopus, which is always served on a round, wooden platter like this. Those red spots? Paprika. Of course. 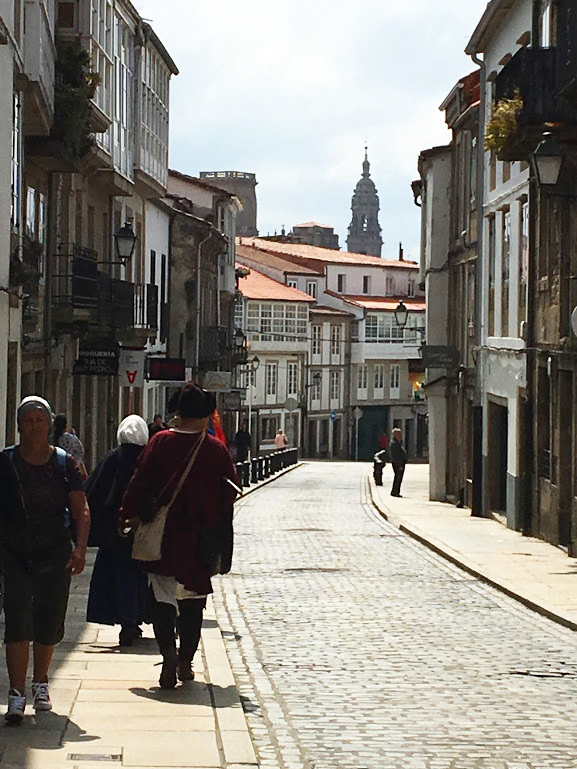 The next day, we were set to make it to Santiago de Compostela. I had fully hit my stride and was feeling confident even on hard ascents. My body had grown more efficient at processing oxygen for my muscles. I also had figured out a gait that could get me safely down descents without hurting my knees. Marc had ever so kindly switched walking sticks with me, letting me use his much lighter one, while he carried my much-too-heavy-for-me one we’d purchased from Lorifactor. Of course, now our journey was ending. Isn’t that always the way it goes? 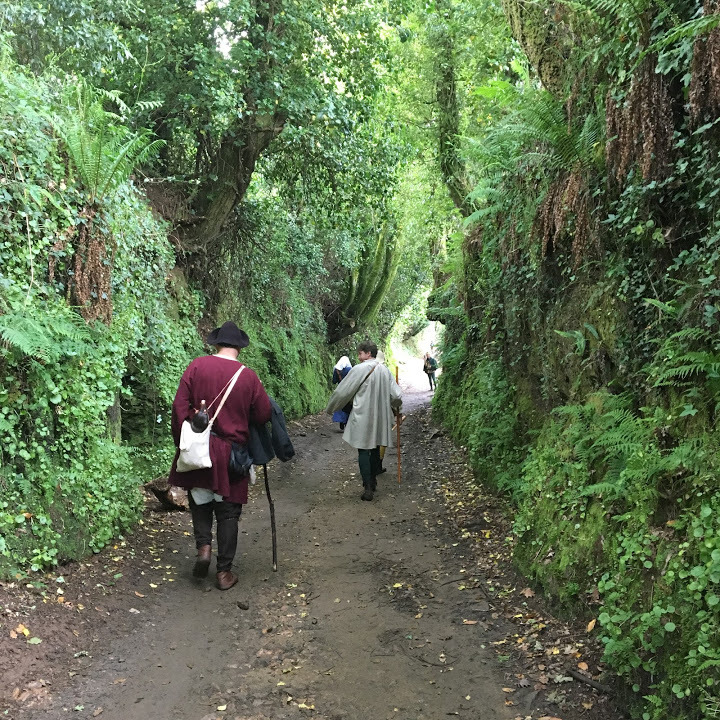 Even while closing in on Santiago de Compostela, we still walked through beautiful sunken paths engulfed in solid greenery. Greg, unfortunately, was having the hardest day of our trek. I knew he was feeling poorly and he was in a terrible mood, chasing me off when I tried to walk with him. Finally he admitted he had a fever. Christian had been battling a fever on and off for days as well, and Greg had clearly picked it up. That, combined with his nerve pain and chorizo-esque heels added up to pure misery for him. I finally settled into walking about 50 yards ahead of him, glancing back periodically to confirm he was still upright and making progress. Part of our group was well behind us, having stopped so Steve could repair one of his shoes, so I knew there was no chance we could abandon him. The closer we got to Santiago, the more we found abandoned or lost gear perched on or near the way markers. We encountered a few orthopedically injured peregrinos along the way as well. This journey is not an easy one. Profound and magical, yes. At one point, Marc and I stopped to admire wild horses moving among the trees in a wildlife preserve off to our left. Greg caught up to us and we pointed out the horses to him. He stared, glassy-eyed, into the preserve. Later he told me that he’d been thinking it would be a good place to lie down and die. I knew this was hyperbole due to his feverish suffering, and we had a laugh over it, after the trauma was past. He also admitted that he’d retrieved his stuffed sheep, Felipe, from his scrip bag and was talking to him to get through this toughest of days. I am a firm believer in whatever it takes and completely understand why a person would talk to a stuffed sheep while walking the Camino. 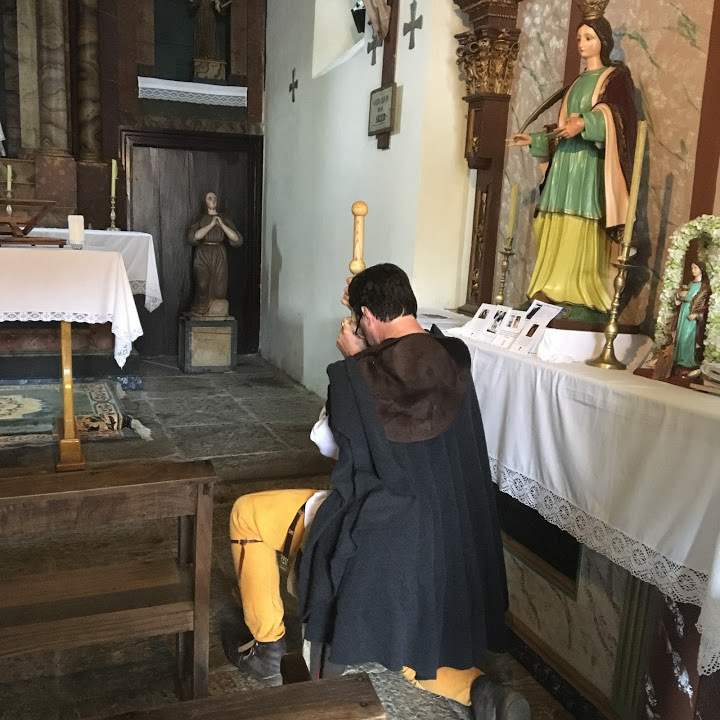 Greg stopped to pray at a little church on the outskirts of Santiago de Compostela. 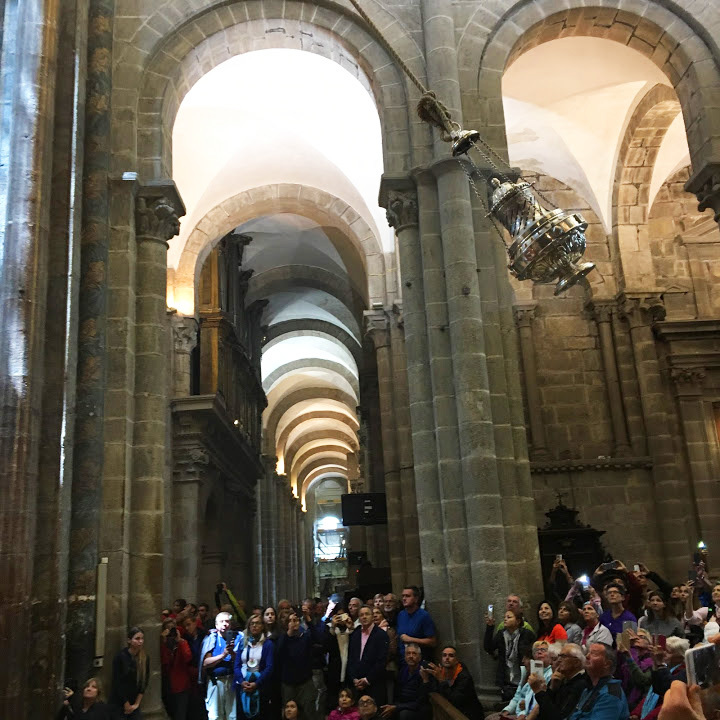 At last, we entered Santiago de Compostela, and made our way to the Cathedral, a baroque behemoth fronted by a square where hundreds of pilgrims milled about and greeted one another. I felt a light-hearted satisfaction. We’d done this huge, hard thing we’d set out to do. Walking through the city, anticipating our first full sight of the cathedral of St. James. I had taken this journey in hopes of attaining some spiritual enlightenment. I found peace in separating from my daily obligations and surrounding myself with unspoiled country day after day. If I achieved anything spiritual, it was my attempt to get back in touch with the natural world and with my concept of God residing in all of it. I also reacquainted with me — parts of me that have had no chance to emerge while existing in the sedate, suburban state of being I normally inhabit. Greg, Felipe, and myself in front of St. James Cathedral. 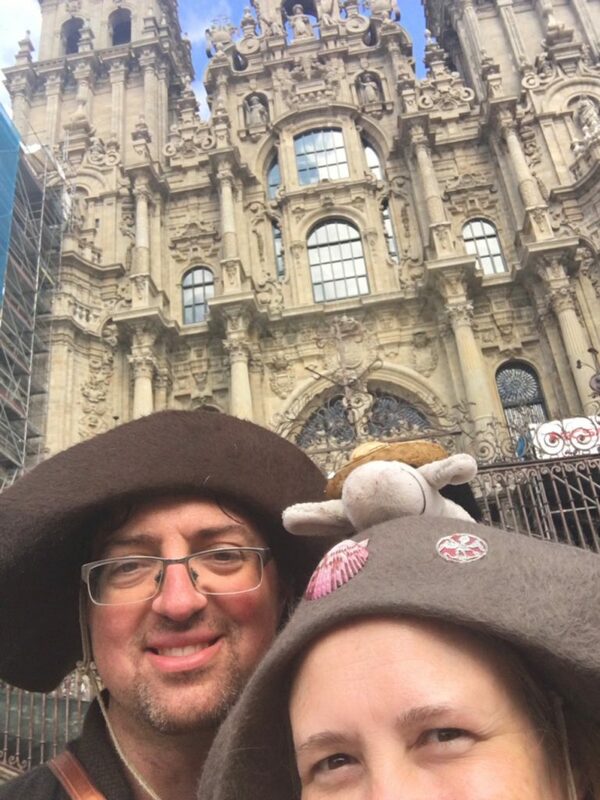 Without a selfie stick, we settled for a “selfito”, my name for a selfie taken in Spain where you can only fit part of your head in the shot. 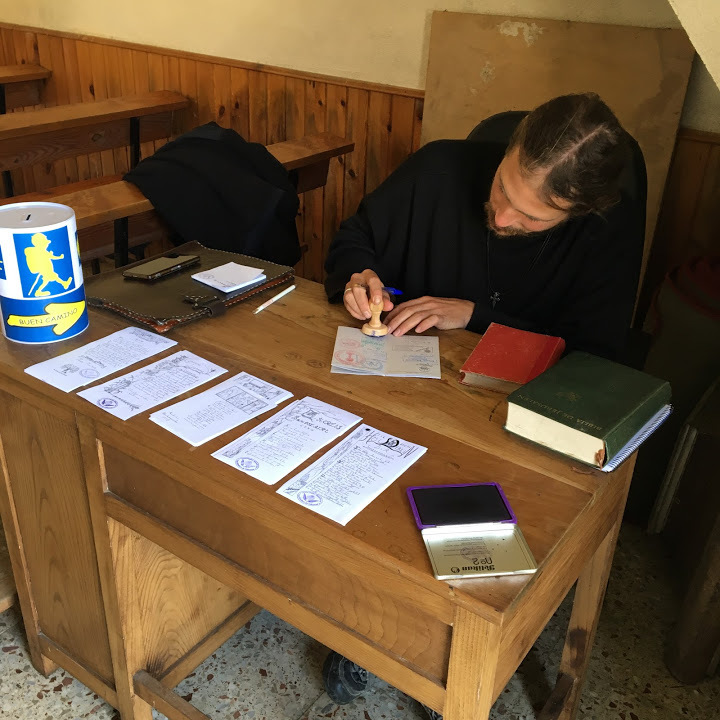 Greg, a relatively lapsed but highly religiously-educated Catholic, had stopped to pray at several churches along the route, and had occasionally read from his book of hours at various small shrines. 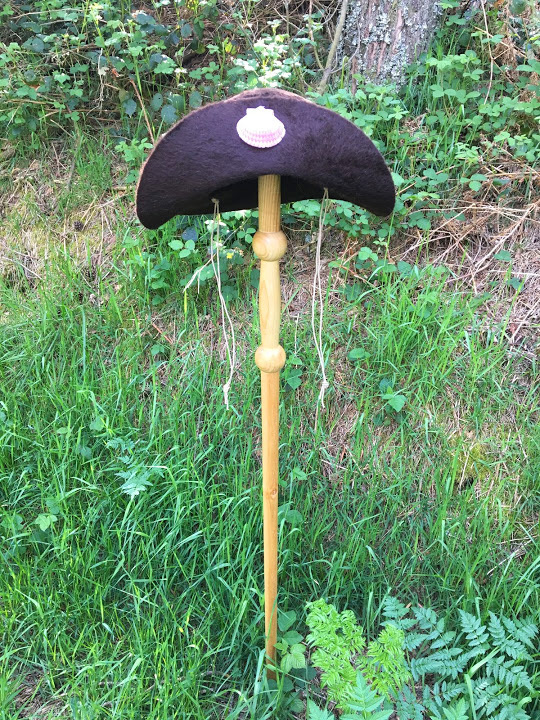 Before our trip, he’d taken our pilgrim staves to the church he’d attended as a child and had the priest there bless them. He’d once made the vow to go on Camino when he wasn’t sure he would walk again. At last, he had fulfilled his vow. 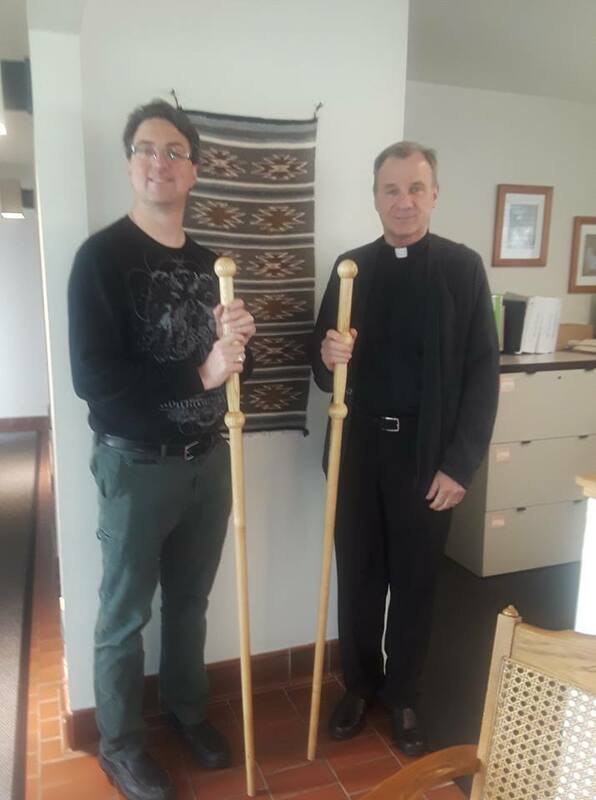 Greg and Father David Hankus at St. James the Apostle Catholic Church in Glen Ellyn, IL, USA. Father David blessed our pilgrim staves before our trip. That evening we took our credencials full of stamps to the office where officials would look them over, confirm that we had all walked the route for at least 100 km. They would then issue us our Compostelas, which are Latin documents stating we’ve completed a pilgrimage to the shrine of St. James. 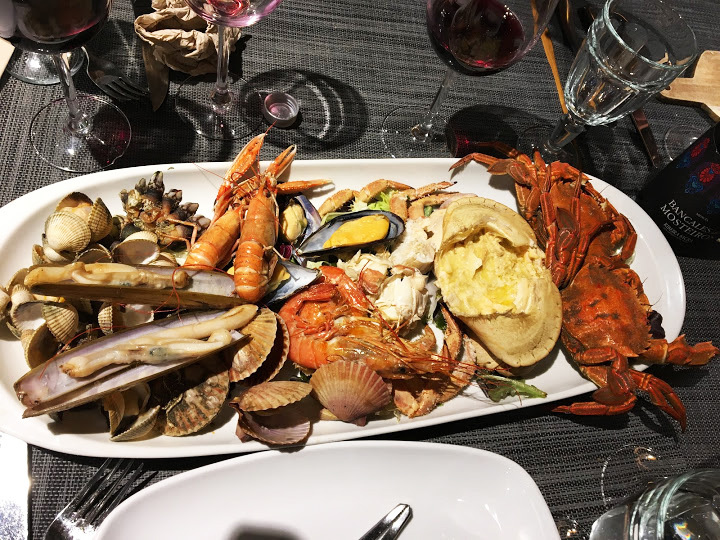 In celebration, we cleaned up in modern clothing and went out for a seafood feast to an excellent restaurant called Los Carracoles in Rúa da Raíña. Seafood feast split by Greg and me at Los Carracoles, including barnacles, which are apparently dangerous to harvest. They were salty, chewy little nuggets; not bad. I don’t think I’d risk my life to pry them off of rocks that are frequently savaged by the hard waves of the Atlantic, but I’m glad I had a chance to try them. 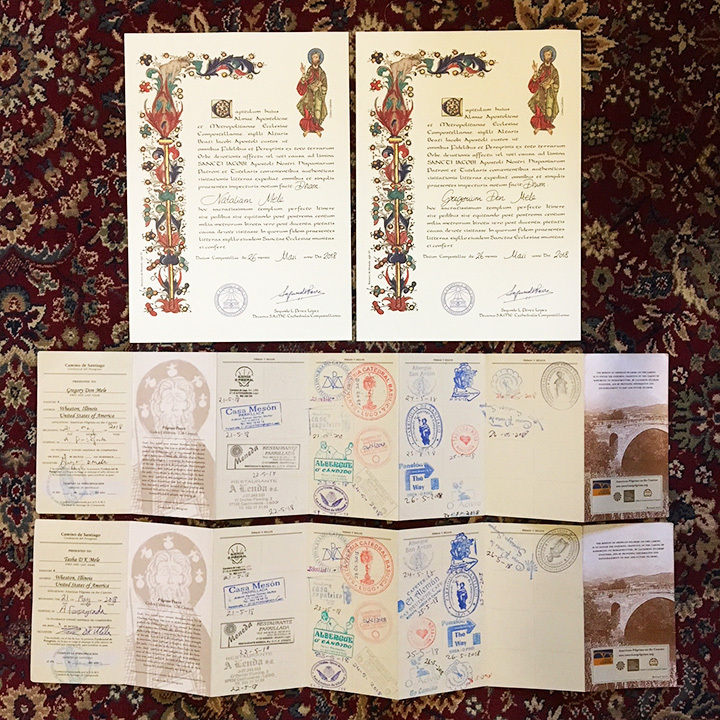 Our compostelas and credencials. Note the name, “Natalium”, on my compostela. This is the Latinized version of “Tasha”, which is a Russian nickname for “Natalia”. My legal name is “Tasha”, though, because that’s how we Americans roll. 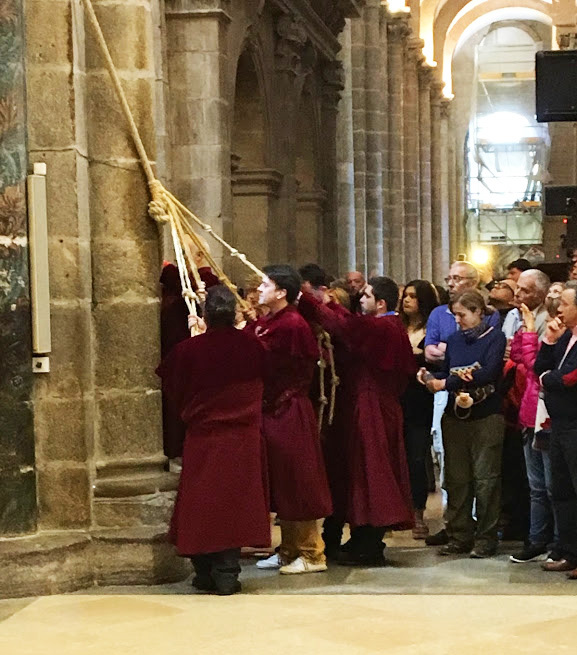 The next day we attended the noon pilgrim’s mass at the cathedral and watched the botafumeiro swing on its chain from one side of the cathedral to the other. Perhaps you have seen video of this huge thurible full of smoking incense swinging, but until you’ve seen it in person, it’s easy to underestimate the speed at which it flies through the air. It’s a sight to behold, and it takes at least six people to hoist it and control its flight. The botafumeiro handlers prepare to release its rope and begin its swing. The botafumeiro as it flies by, almost too fast for my camera to catch. We stayed at an apartment very close to the cathedral, ideally situated for walking around the old city and finally behaving like tourists. It was time to buy souvenirs. Some jaded travelers scoff at such things; I’m an unrepentant souvenir acquirer. In particular, I pick up refrigerator magnets wherever I go because looking at them on a daily basis gives me a brief reminder of past happy adventures. I also look for Christmas tree decorations, which are often harder to find. Fridge magnets I’ve collected since 2014. 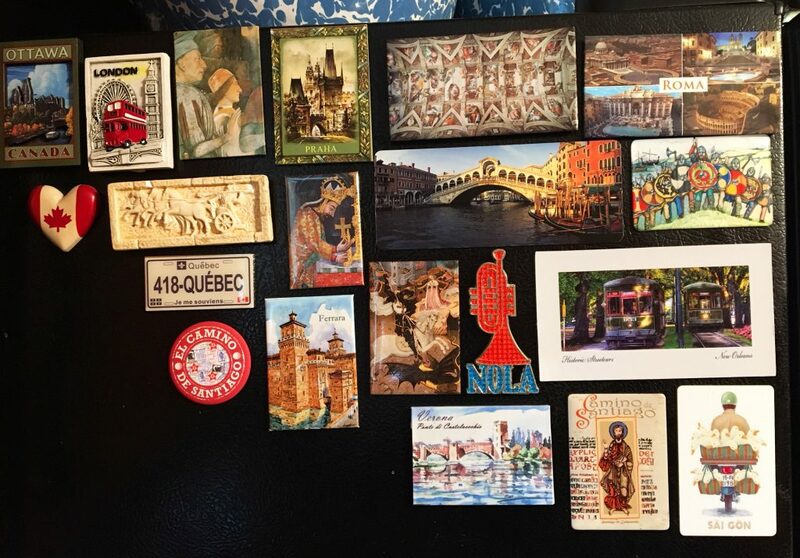 A few were gifts — the Greek one and the Saigon one — but mostly they’re my selections from our travels. I have an earlier collection in storage somewhere. I mentioned above that I got to know me a little better on this long walk. For instance, I had the insight that walking in unflattering male clothing, wearing a man’s hat style, and generally being somewhat gender-neutral for six days straight left me with a hankering to transform into a modern, feminine woman at the end of it. I went shoe and clothing shopping, and put on makeup with relish. I bought a pair of girly sandals I might have never otherwise purchased and wore them with relief. In my life, I’ve gone through many outward changes — hair style and color changes, weight changes. Sometimes I reveled in looking a bit boyish, an on-again-off-again habit I’ve indulged since my early teens. But now, as my middle age is in full swing and I’m watching my face and body begin its gravity-assisted devolution, I find both sides of me in conflict. On one hand, I want the comfort and no-nonsense of traditionally masculine accessories, but on the other, I’m clinging to what feminine allure remains for me, as the clock ticks down to the crone phase. I used to go to an Italian barbershop in Philadelphia where I grew up. The barbers didn’t know what to make of me. I insisted on a boy’s haircut. We 80s kids were masters at signaling gender fluidity long before it was a part of the progressive zeitgeist. A part of growing older is that over time we lose friends. 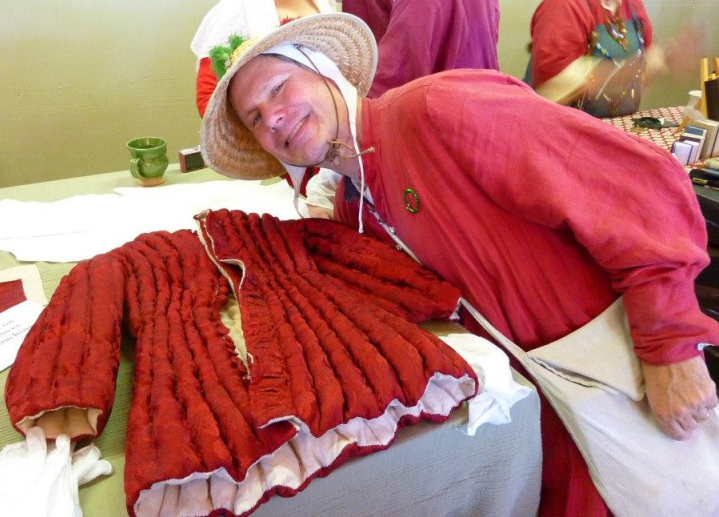 A few years ago a friend who was active in medieval research and re-enactment, Will McLean, passed away too soon. Will was good company every year at Pennsic War, the giant SCA event held in Western Pennsylvania, USA. My best friend Greta and I could always rely on his company and witty quips. He made us laugh so much. Anyone who has ever heard him perform his rap, “Blak P”, will know what I mean. Will was a founder of a tournament company, the Company of St. Michael, that helped bring formal passages of arms to popularity in the SCA. In its later years Greta and I helped him manage it. 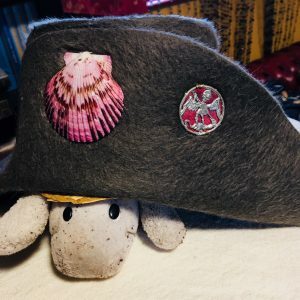 In honor and remembrance of Will, I wore my St. Michael’s badge on my hat. 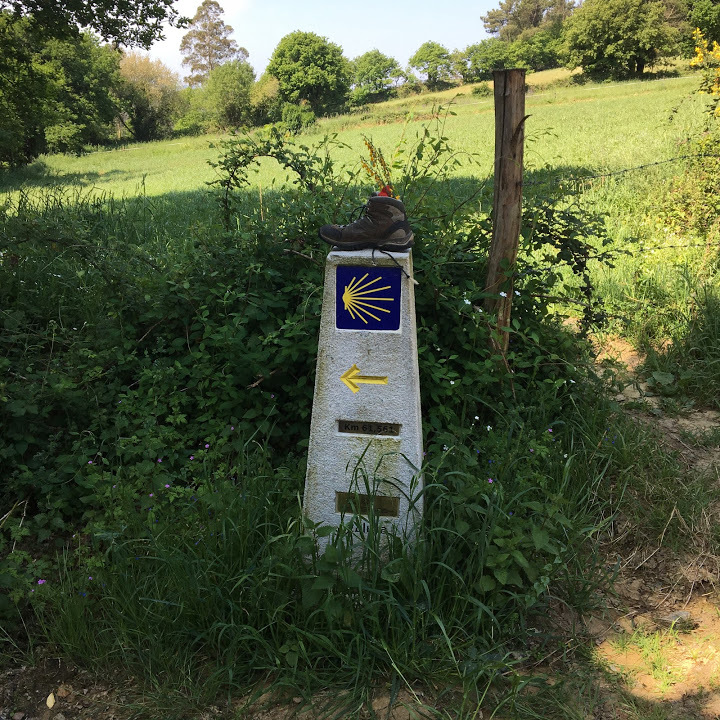 The scallop shell is the symbol of a pilgrim on their way to Santiago de Compostela. The St. Michael badge is there in honor of Will McLean, my departed friend who founded the Company of St. Michael, a tournament company. Badge by Billy & Charlie. Will as I will always remember him, grinning in impeccable late 14th-century clothing and accessories, a gentleman to the end. Greg recently lost an old friend of his, Aaron Popowich. Aaron was one of the original founders of the Chicago Swordplay Guild with Greg. At one point, Aaron went traveling through Spain and ended up running with the bulls in Pamplona. When he returned to Chicagoland, he gifted his red sash to Greg, who wore that sash on our walk in remembrance of Aaron. Greg and Felipe and the memory of Aaron. 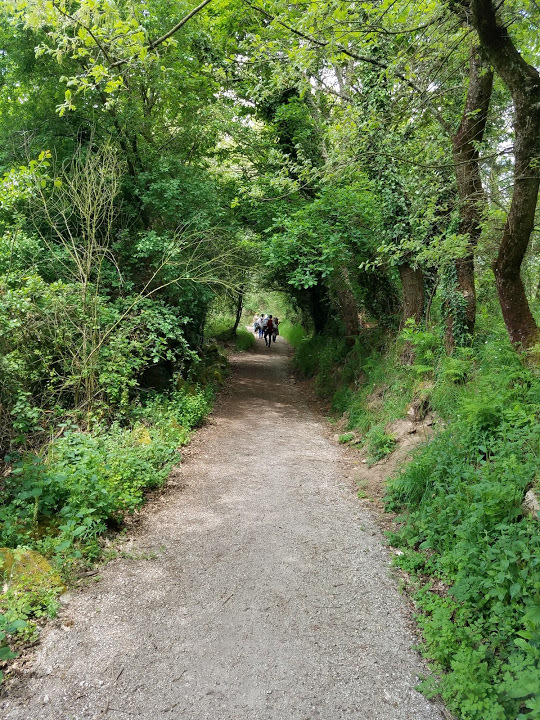 On a side note, before this trip, Greg brought up the possibility of encountering wild dogs on the various Camino routes and mentioned more than once that he could handle any wild dogs crossing our paths, thanks to our long, sturdy, walking staves. 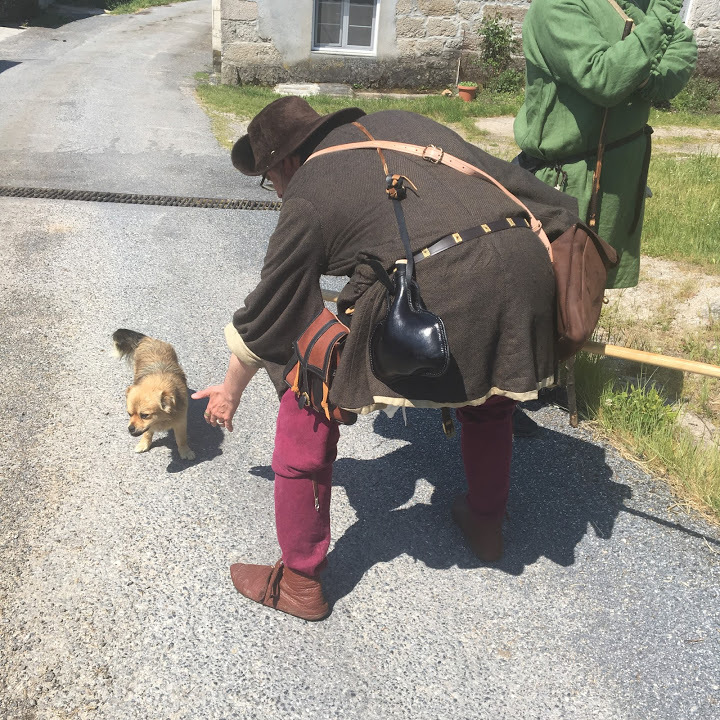 In honor of his anticipation of a dust-up with wild dogs, I give you a tour of the Wild Dogs of the Camino we encountered. Greg gave them serious what-for. Greg luring in a wild dog. 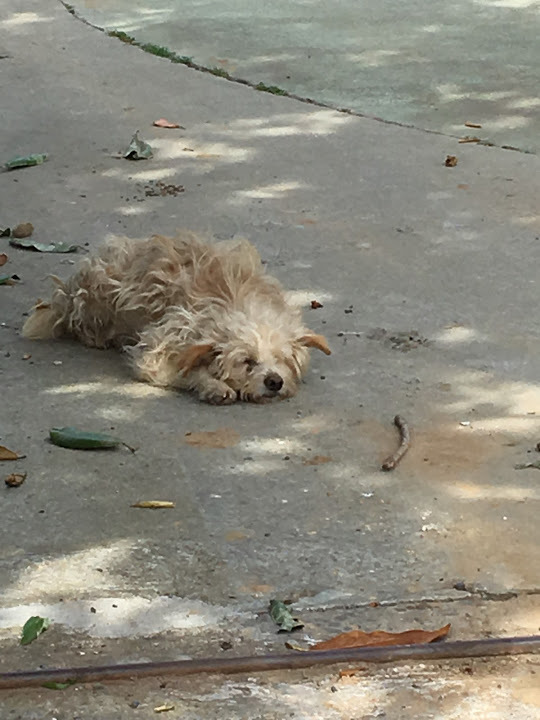 This wild dog was the one I called our hosts at Casa Camino about, to see if he was their missing pup. They knew this little fluffball and assured me it was not theirs. 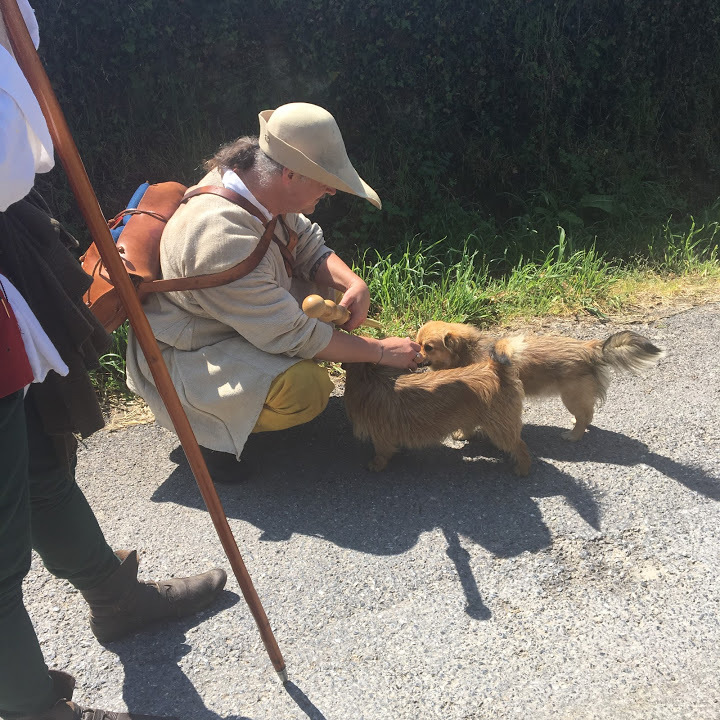 Marc lures these vicious, wild dogs in for some gratuitous petting. Greg shows this particularly wild dog who’s boss. 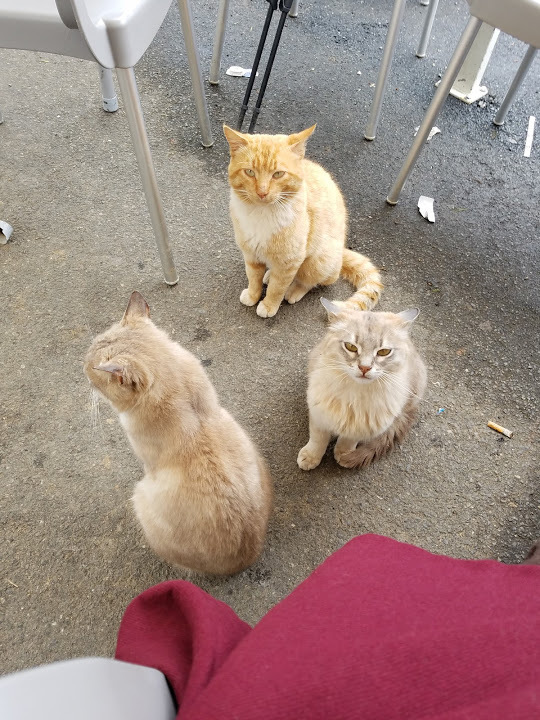 The wild cats of the Camino were not to be out-begged. Thanks, Dad! Glad you enjoyed it! This was a lovely read. I almost felt like I was on the journey with you. Thank you. I’m also curious as to the economics of this trip. Did you book your lodgings in advance? Do you really need a chase car? Looks like most could not be done in a wheelchair. Is there an accessible route? Hi, I’m glad you liked the write-up. To answer your questions: 1) If you’re going directly to Spain and not to Italy first like we had to do, it’s not expensive at all. Your biggest cost is airfare. If you want to stay in pilgrim albergues or in economical pensiones, you can book ahead in many such places (private versus public ones — usually the private ones allow advanced bookings and are nicer. They cost a little more, but we’re talking a difference like 10 or 20 Euros a night versus 5 Euros a night, so I think it’s well-worth it!). Food is generally very cheap in this part of Spain, I found. 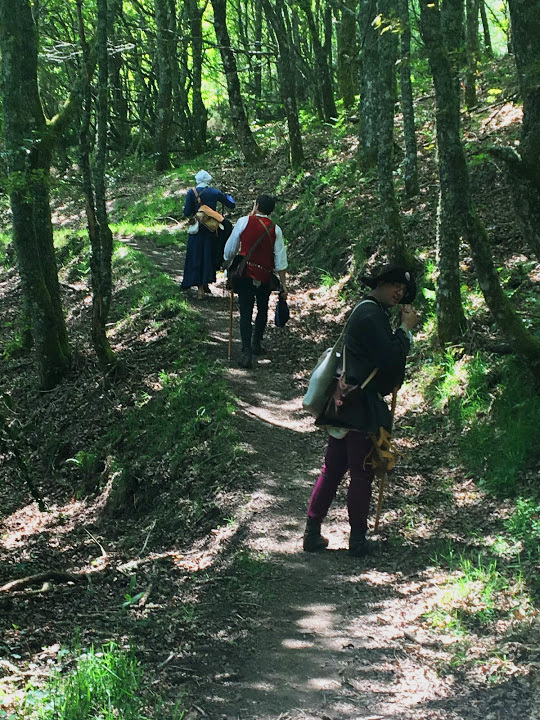 You’ll want to pack snacks and possibly a full lunch along certain parts of the route, if you’re going on the Primitivo. You cannot always find a good café-bar or restaurant when you need one. Also, siesta (or “long lunch”, as it may be thought of), can prevent you from having good options too. You can totally do this trip with all your belongings in a big backpack, but that requires a level of fitness beyond what I was prepared for, personally. I think I could do it on the Frances Route, as long as I wasn’t climbing over mountains. There are also taxi services you can arrange to have take your belongings from one place to the next. These are well-established and work well. I think they charge around 5 Euros a bag per day. You definitely cannot do the Primitivo in a wheelchair. We’re talking bumpy, narrow dirt and gravel paths up and down the sides of mountains, sometimes with stair-shapes cut into them. I’m not sure if any of the other ways are wheelchair accessible. There are some great websites out there that cover a lot of detail. Best of luck finding further answers! Yikes! I cannot believe the shoes you chose to wear on your pilgrimage! Beyond that fabulous photos and narrative. 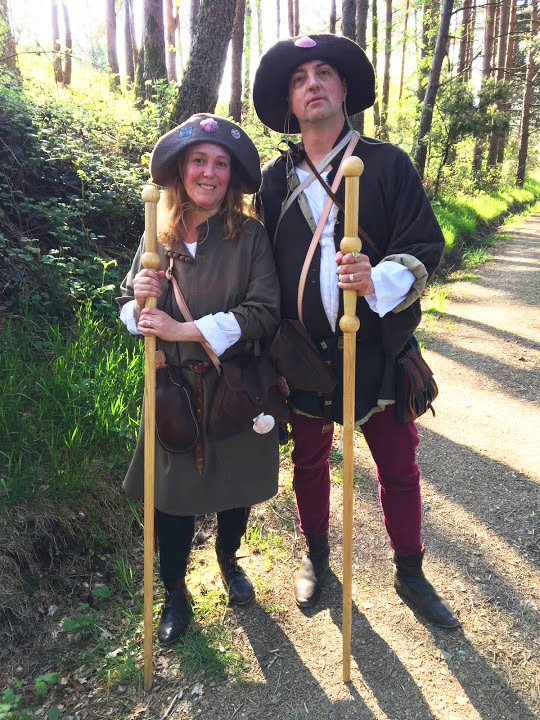 My husband and I look forward to walking the Camino. Your post is inspirational.